I can officially say that I started our Halloween decorating today! 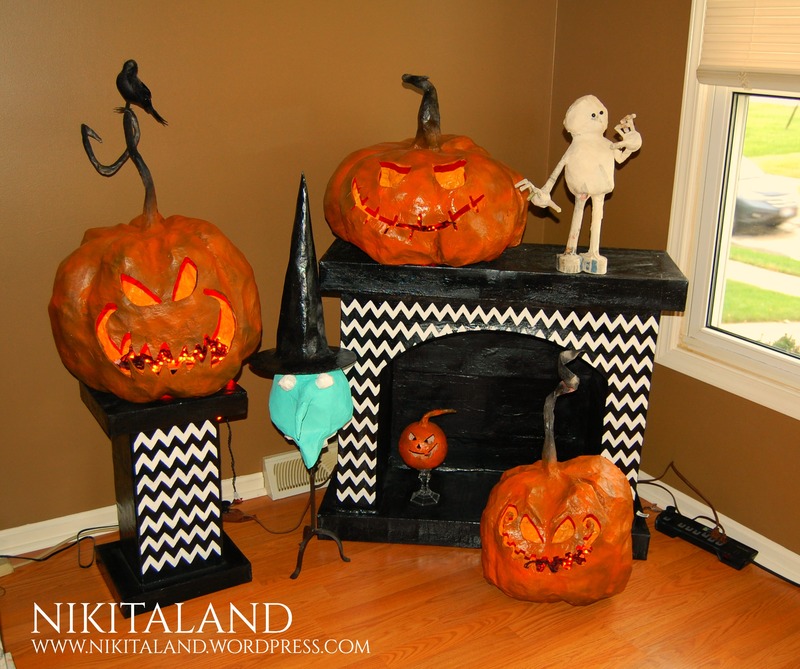 I started pulling out all of my paper mache pumpkins, my paper mache mummy, my paper mache witch head that I am still working on, and the paper mache fireplace. I have had a few people ask to see the finished fireplace, so I made sure I got it in the photo! I still have a lot more pumpkins to unpack for our inside Halloween decorations, and I always bring out our lighted Halloween Willow Trees too to give the living room a nice eerie glow. 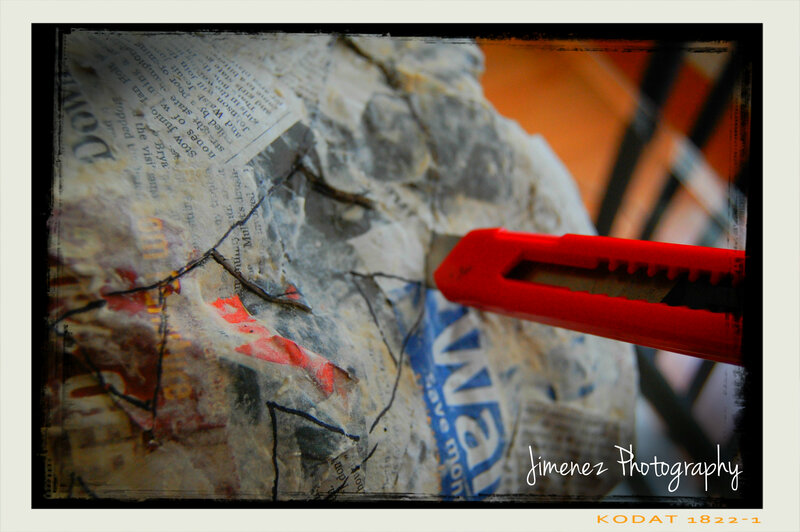 Everything in the photo above, is made in paper mache! I wrapped my own body with clear packing tape from my waist to my neck. 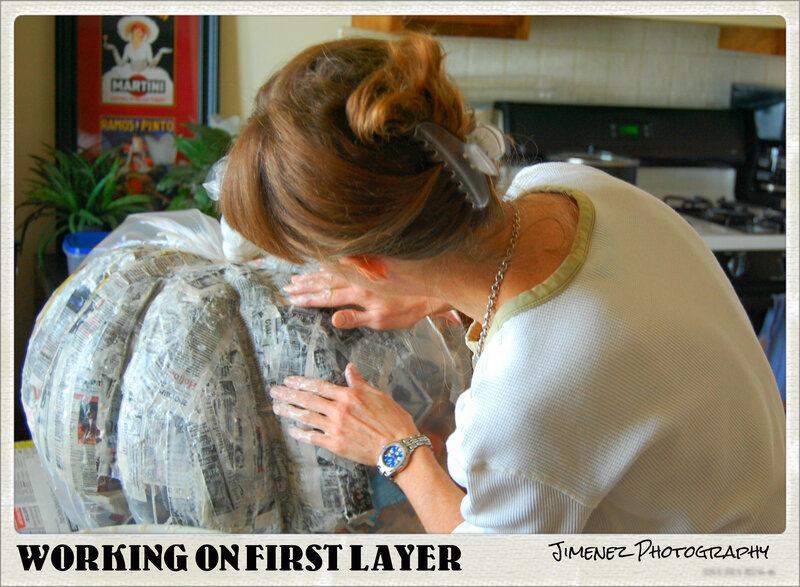 When you do this, the first layer of packing tape must be sticky side out so it does not stick to your clothing. Once you get the first layer of packing tape around your entire torso, you then keep wrapping with the sticky side towards you. What you are doing here, is making a nice form for a torso. Once you get enough packing tape around you, the next step is to get the form off of you. Either have someone cut the form off of you, or you can do it yourself, but be careful not to cut yourself! The next step is to make some arms for your new torso. I just opened up the newspaper and took one sheet and rolled up some long strips, then rolled a few more sheets around that first one. Tape up the side so it does not unravel. Make two arms. 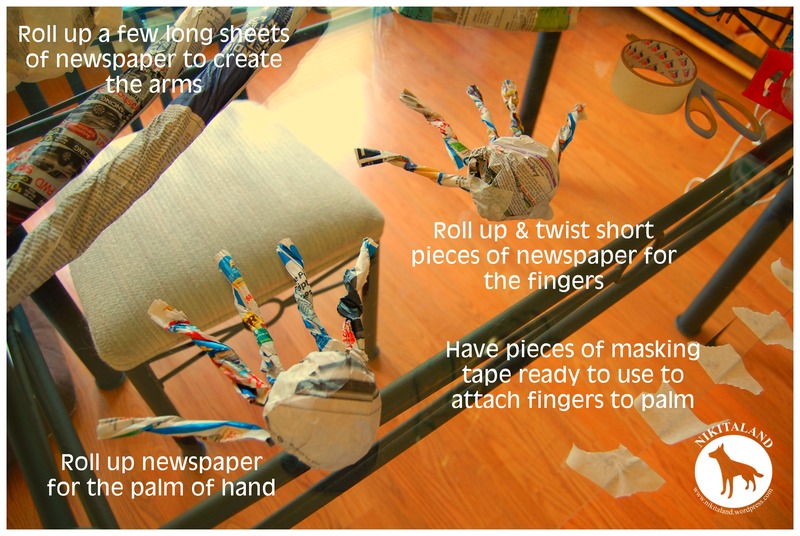 Now you need to make the hands – just ball up some newspaper for the palm and tape it, then roll up some shorter strips of newspaper for the fingers. Tape the fingers to the palm. 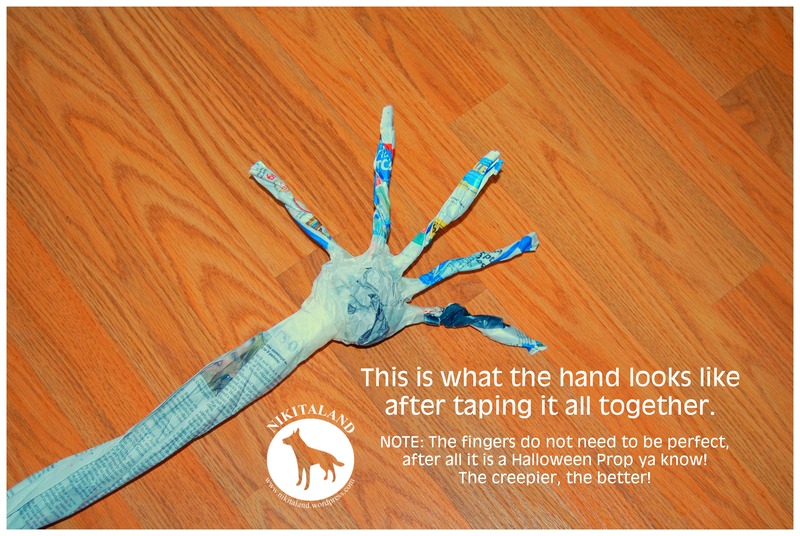 Don’t try to be too exact in the length of the fingers, because you are making a scary Halloween prop, ya know! The weirder the better, if you ask me. Now that your fingers are attached to the palm, attach them to the arm, and you are now ready to attach the arms to your torso. I know that some of this sounds a bit too much, but it goes really quickly. Nothing has to be perfect at all because you don’t want a perfectly formed Halloween prop. 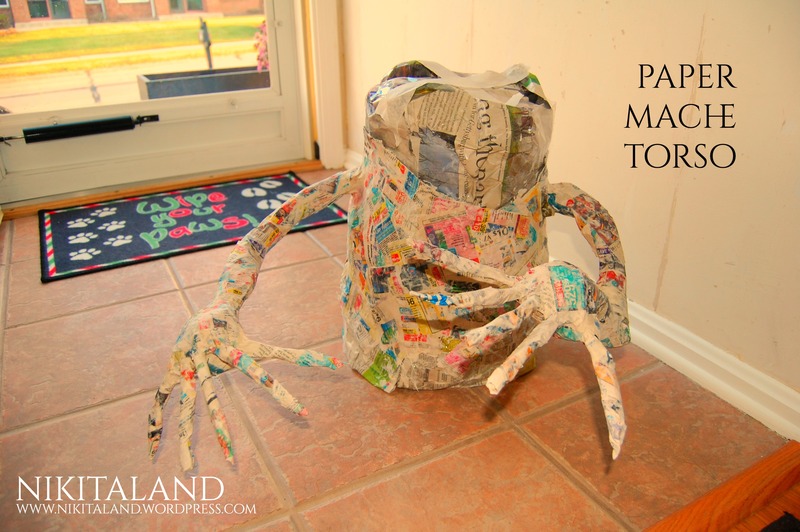 Once the arms are attached to the torso, you can bend or crease the newspaper arms to whatever shape you want. Do you want your prop reaching out for you, or do you want it to be reaching up in the air, the choice is yours so make it any way you wish. Here is what the torso looks like now, just a few more layers of paper mache to go. HINT: For anyone attempting to make anything in paper mache, make sure you have lots (and I mean lots & lots) of layers of paper mache around your prop, otherwise can cave in. The arms on this torso prop are hard as a rock right now because it has many layers on it. I will be adding a head to him this weekend so it will make him pretty close to completion. I am still tossing around the idea of putting him out in the yard, but I will need to seal all the paper mache really good so the weather does not ruin him. Flex Seal is what I would use on this guy if he heads outdoors. It feels pretty good to look around our living room and see all of the paper mache items that I have made over the years. They were all easy to make, but they just take a lot of time to complete. 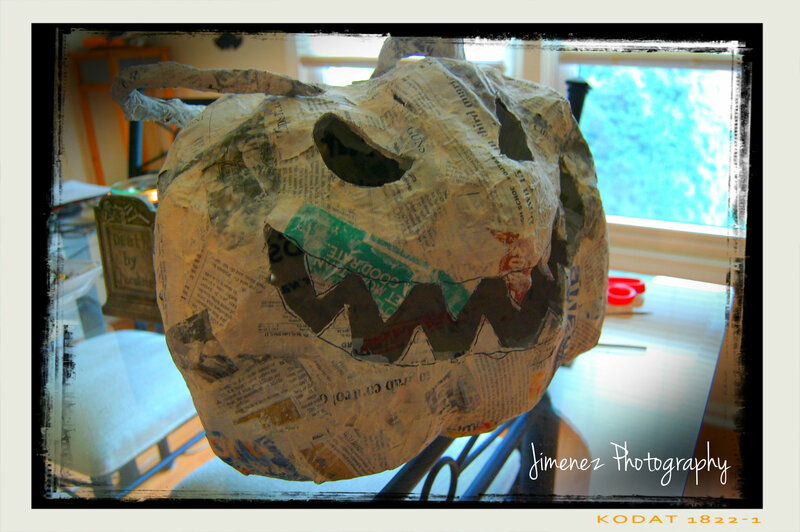 Have you started on any new paper mache Halloween items this year? 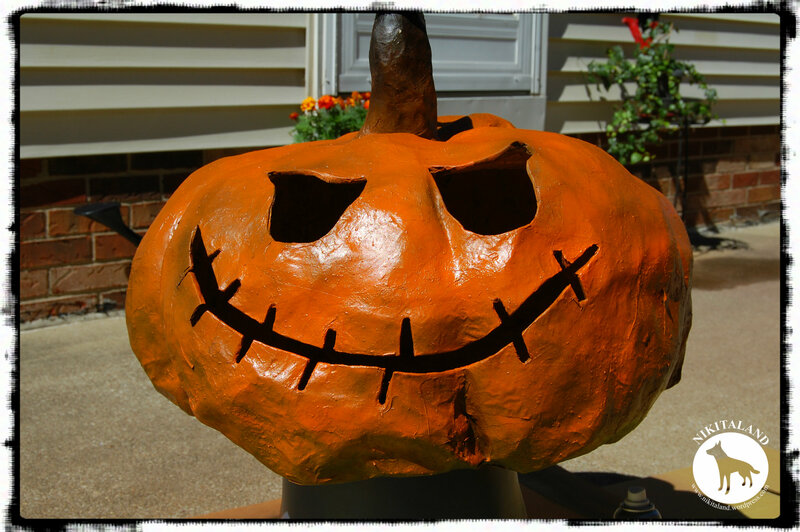 Welcoming Fall is always fun, because I can start making more paper mache pumpkins! 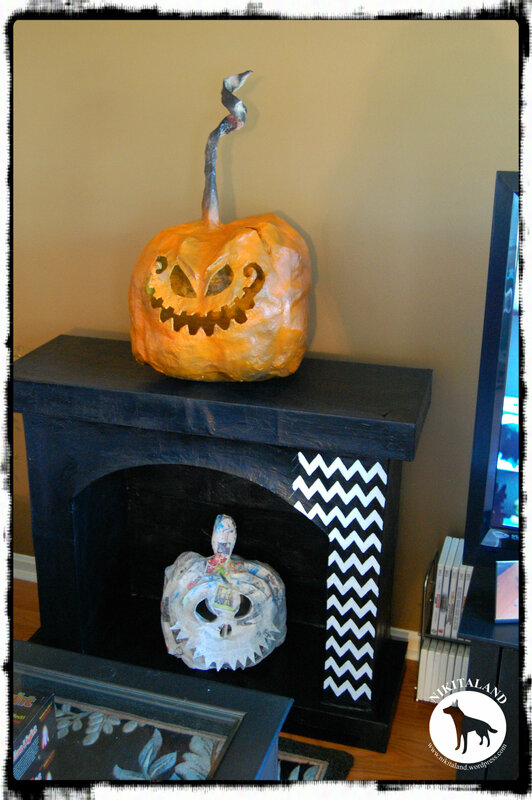 If you know me, you know that I have made many paper mache pumpkins, a paper mache mummy, and a paper mache fireplace. I had a thought that I wanted to try, and I decided to go “smaller” this time around with some cute paper mache pumpkins. I started off with blowing up two balloons nice and small. I did try tying a string around one of the balloons, but it did not make a difference, so I did not use it on the second one. Now comes the fun part! Make sure you have lots of little strips of newspaper cut up, dip each piece in the paper mache paste, and run the strip through two fingers to remove the excess. Then place piece by piece on your balloon. 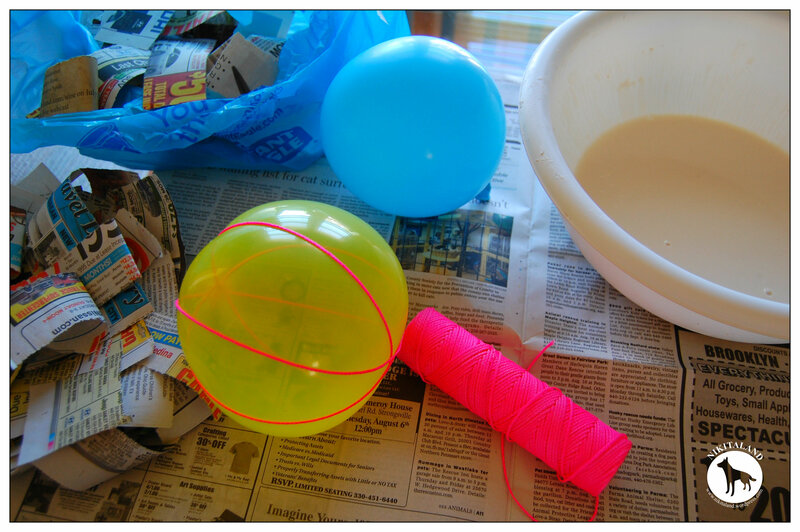 Run your fingers over each piece so that they are laying flat on the balloon. Keep going until the entire balloon is covered really well. Let your paste dry. I normally get out my small heater and place it next to my object to get it to dry faster. 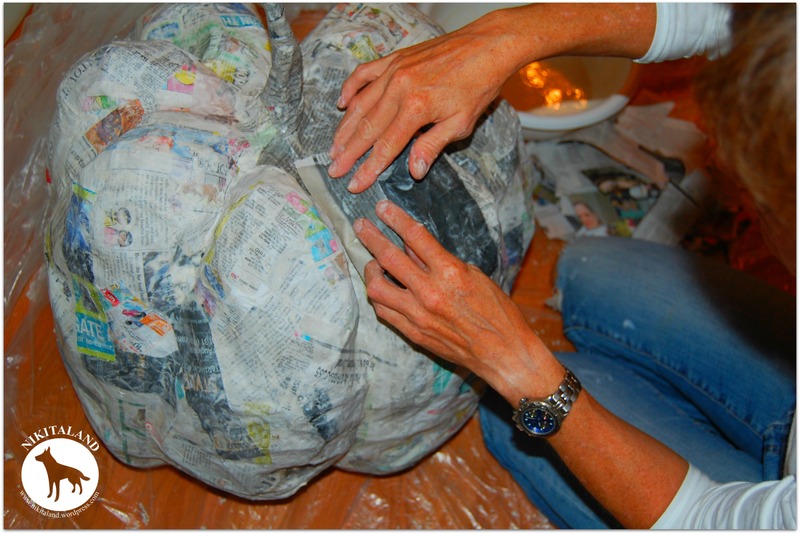 Once it is good and dry, you need to add another layer of paper mache newspaper strips all around the balloon. Let that layer dry, and keep doing this step over and over until you have a pumpkin that is so hard that you cannot push in any part of it. THIS PART IS EXTREMELY IMPORTANT. Once your pumpkin is formed and nice and hard, you are now ready to draw a face on your pumpkin. You can use a pencil to draw your face on, or a Sharpie Marker. Once you get the face drawn the way you want it, you carefully take your sharp knife out and cut out the face. Go slow in this process so you do not slip and cut yourself! Since I am making really small pumpkins here, the openings on the face are too small for me to insert a battery operated tealight in it, so I cut a round opening in the back of the pumpkin for this purpose. Wait, I am not yet done yet at this point. Since the face and the hole in the back are now cut out, I want to make nice smooth edges around what I just cut out, so I placed a few more pieces of the newspaper strips dipped in the paper mache mix around the face and the hole in the back. Let it dry. 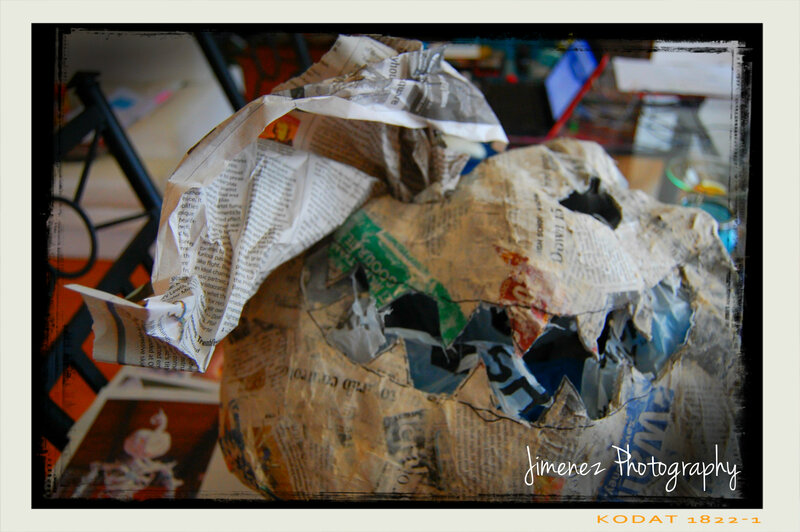 Now it is time for the paper mache pumpkin to be painted. 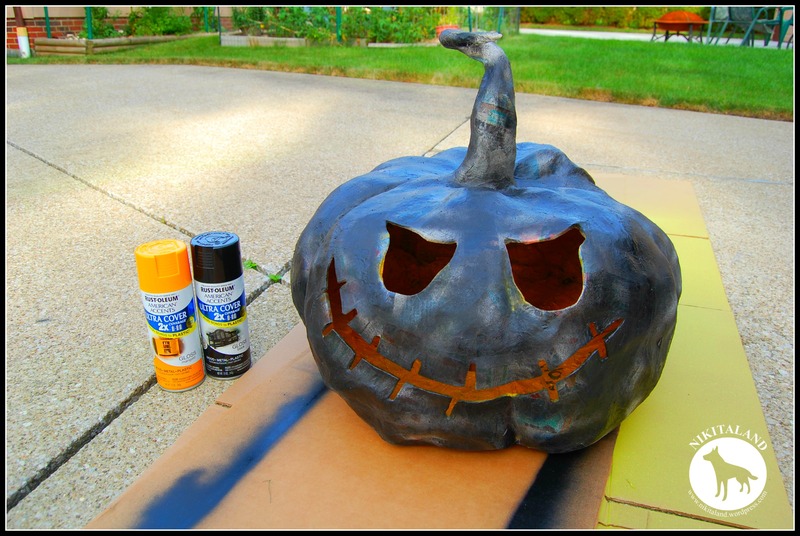 What I do for all of my paper mache pumpkins, is to lightly and I mean lightly, spray paint the pumpkins with flat black paint. I do not cover the entire pumpkin all in black, but rather get it slightly covered as a base coat. Once the flat black has dried, I am ready for the orange top coat. Just like the base black coat, I lightly spray paint my orange top coat over the pumpkin so that some of the black shows through. I think this make the pumpkin look so much better. I decided that my pumpkins needed something. I felt that they needed to be on display, and what better way to display them than with a cute base! 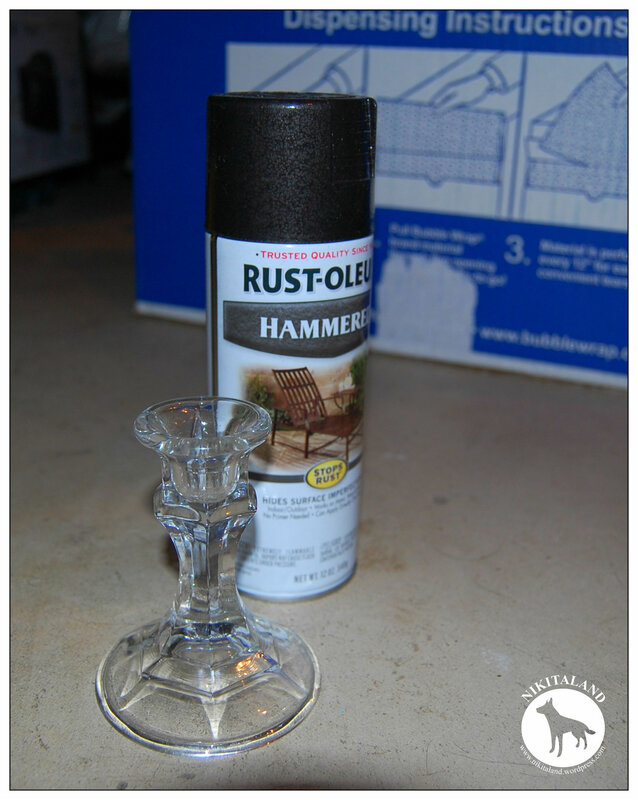 I used a $1 glass candle stick base that I found at the Dollar Store, and spray painted it with a Hammered Black paint. I went over the candle stick two times just to make sure that it was evenly coated. 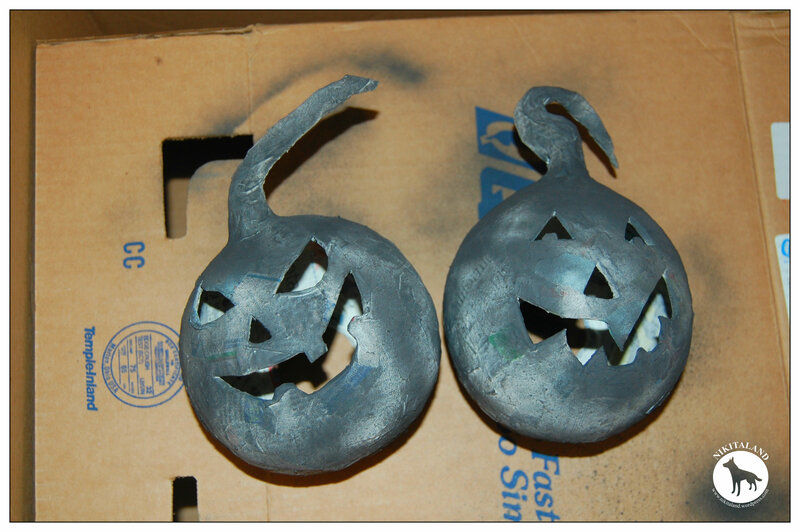 The last thing that I did was to spray paint a clear coat over the pumpkins to keep the paint sealed. The last thing that I did was to glue the pumpkin onto the candle stick base, and I now have an adorable pumpkin decoration! 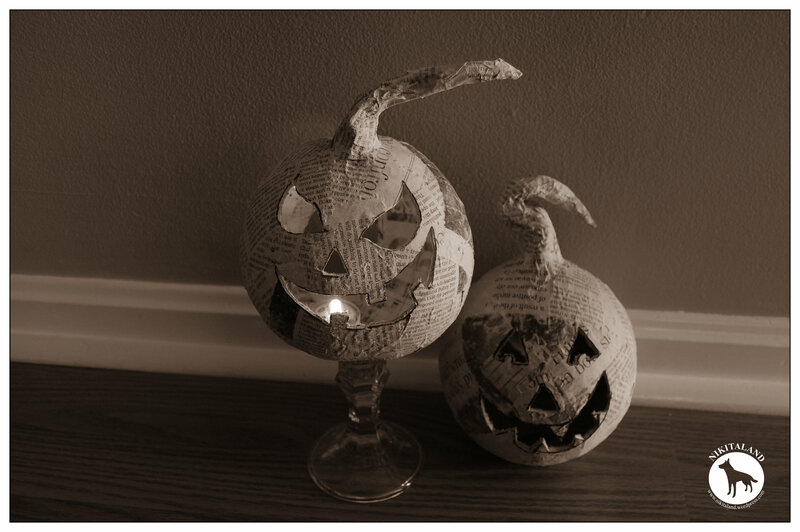 One thing to note when lighting up any paper mache pumpkins, is to never ever use a real candle in your pumpkins, as they could definitely catch on fire! Always use a battery operated tealight in them for safety! 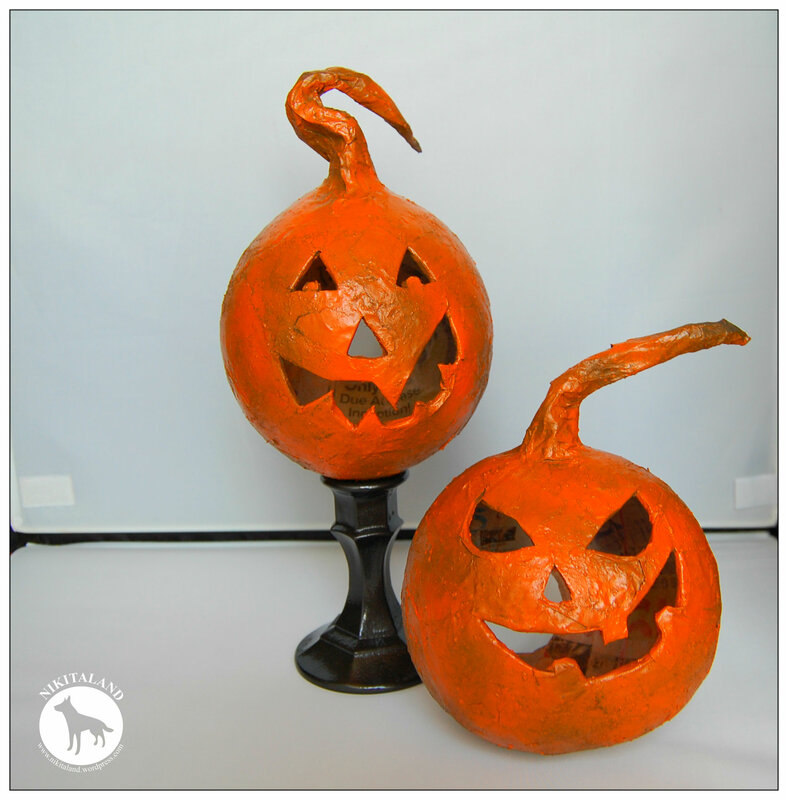 My finished paper mache pumpkins are approximately 6″ and will definitely add some flare to my Halloween decorations around the house! 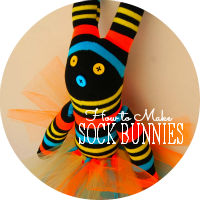 Now that I see how cute these turned out, I have already started on a few more because I know that they will look great in every room of the house! Now, back to the Dollar Store for more glass candle sticks! The excitement is building around here for Halloween! My calendar tells me that we have only 19 more days until Halloween, and I am frantically still trying to get all of my Halloween prep done. With Skully & his friends hanging out in the front yard, I decided that Skully needs to be holding a paper mache pumpkin. (The pumpkin above will be what he will hold in his skeleton hand!) I decided that the pumpkin he would hold needed to be a bit smaller than the ones I have already made. I just took a plastic grocery bag (ya know those little blue plastic bags at the grocery store) and stuffed it with lots of paper, then went to work! 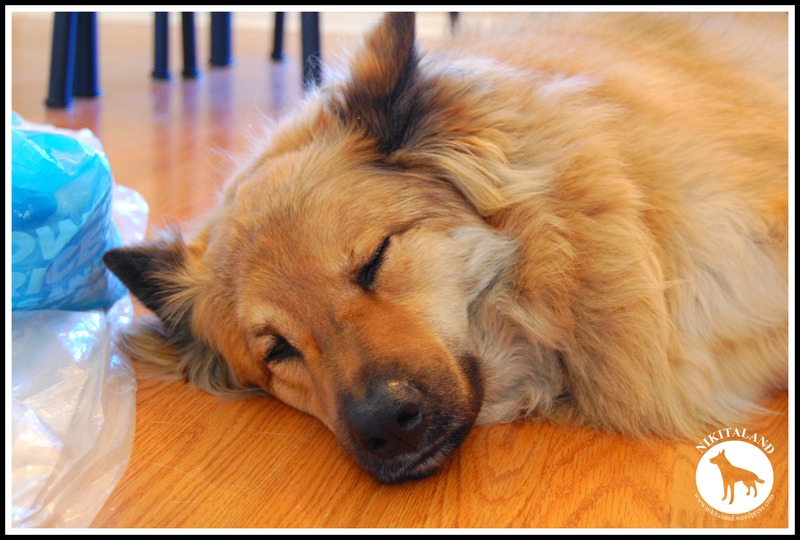 Both Nikita and Bella take turns napping next to me on the kitchen floor while I am paper maching the pumpkins, and it is so cute. Every few minutes, they peek at me to see what I’m doing, and back to sleep they go. I think that Nikita liked laying next to the little heater I have that is drying the pumpkins, while Bella sat by the back door, basking in the sun. (that is one of Bella’s favorite places to sit) I think Bella loves sitting by the back door because she can see Molly, our neighbors dog when she comes outside. Today, we’re going to be back out in the front yard adding more props and lights to our graveyard. What? You thought that we were done after you saw the photo’s of Skully & his friends? Nope! We have many more props to bring up from the basement to fill up the front yard, so keep watching to see how we transform our front yard into an awesome Halloween display. On a special note for today, our wonderful next door neighbors are getting married! Yep, Julie and Shawn are getting hitched and we could not be happier for them! We saw Shawn drive away this morning in his white vintage Mustang, all dressed up and ready for his exciting day! We wish them the best of luck & lots of love on their special day! Congratulations! I can’t help myself. These pumpkins are addicting to make. I am on Pumpkin No. 5 right now, and have No. 6 in the works. Pumpkin No. 6 will be a much smaller pumpkin that I am going to pose in the hand on Skully in the front yard as he is holding up my handmade pallet coffin. Pumpkin No. 5 is by far my thickest pumpkin ever! I used my Evolv Jigsaw and a drill to carve out the face. You start with the drill to make an entry point for the saw blade, then slow the speed down on your jigsaw a bit and carefully follow the face drawn on the pumpkin. I drew a few mouths and eyes by hand on the pumpkin before I found one that I liked. I know, they all could have been ok, but since I am perfecting my pumpkins as I work with the paper mache, I am going for perfection. After I got the face that I wanted, it was time to get to work and cutout the face. I cut one of my pumpkins with an Xacto Knife, but that took me close to an hour to cutout the face, so I changed to the Evolv Jigsaw to make this part of the process much quicker. You have to be extremely careful when using any saw, but you work slowly and keep all of your fingers out of the way of the blade, and you will be ok. 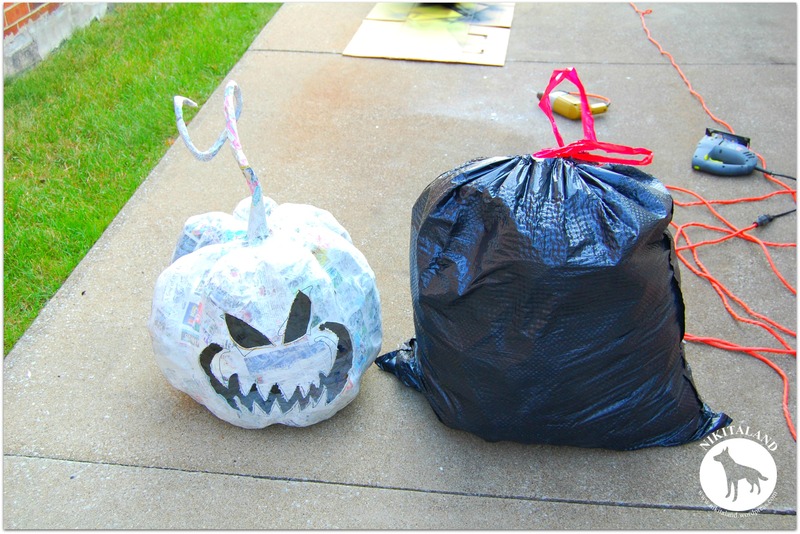 I have learned a lot from making all of these paper mache pumpkins, and one thing that I have learned is that you MUST stuff the plastic bag really full of crumpled newspaper so that the pumpkin holds its shape. This photo shows how much “stuffing” came out of this pumpkin. 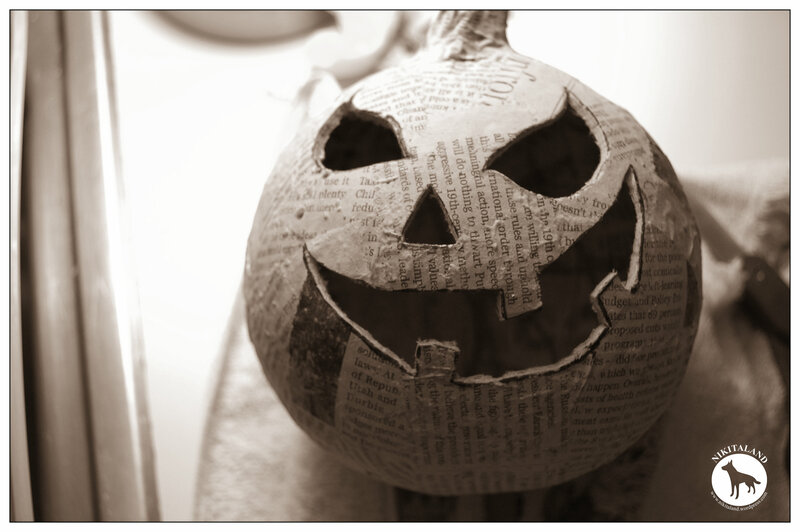 When you remove the stuffing (aka, crumpled newspaper) from the pumpkin, you keep it for your next pumpkin. Why reinvent the wheel and crumple more paper, when you already have a bag full of stuffing! With all of my craft projects, I use what we have around the house. I save a lot of odd things, just in case I need them, one being the nice hard cardboard kitty food boxes. These came in handy for making a table. I just took three empty kitty food boxes and two old UPS shipping boxes and taped them together. Then I mixed up a batch of paper mache (flour & water) and went to work! The UPS boxes made the perfect top & bottom to my little table, as the kitty food boxes made the perfect column. So, what do you think of Pumpkin No. 5? It still needs to be painted, but it looks great in the front window, even unfinished. I also used one of our LED camping lights inside this pumpkin instead of the orange Halloween lights which makes it glow differently than the others. Variety is the spice of life! I just happened to notice it the other day, on how the spiders around here are busy getting ready for Halloween too. They are busy spinning their webs in each corner of our windows outside and I was going to use the broom to brush them away, but then I thought, no wait…. this is the perfect natural setting for Halloween. Thank you spiders for helping out! If you have noticed my absence (or maybe not), I have been busy over here working on all of my paper mache projects and I can gladly say that I am getting close to putting the final touches on them! After our experience of almost catching our Jack Skeleton pumpkin on fire, we have ordered another camping light and will only use regular AA batteries in it, and not the Lithium ones as they turned out to be way too powerful for a little $5 camping light. I am working on finishing the paper mache fireplace too, as I already have one side of stenciling done and will be working on more today. Normally, when you stencil, you just tape the stencil down and dab your dauber of paint on it, but since the fireplace’s front is not quite flat, I used my silver Sharpie marker and am drawing the stencil on first, then hand painting the white zig zag on the fireplace. I know, it is going to take a long time, but I have a steady hand and a small paint brush that is getting the job done. 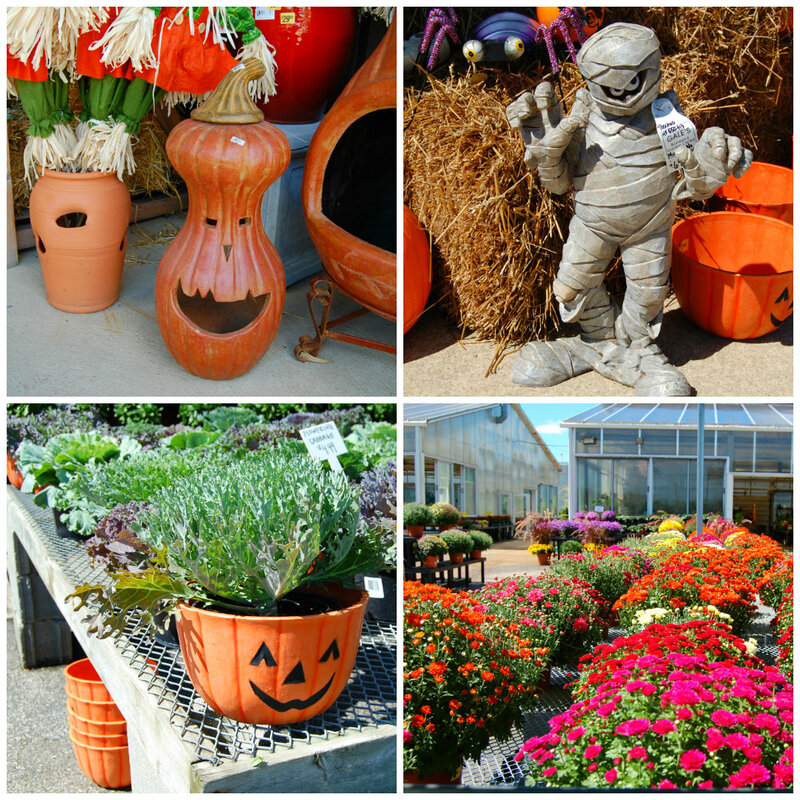 We stopped in a garden center over the weekend to look at their Fall display and saw the most amazing mums and decorations. I wanted to purchase everything because it was so beautiful, but refrained. They had the cutest terracotta pumpkin on display and an adorable mummy that I really wanted, but after looking at the $69 price tag, I did not think it was cute anymore! LOL How come all of these garden centers jack up the prices on their stuff? I wonder sometimes what the real cost of the items are. Our garden is still producing and I am NOT going to tell you the exact amount of tomatoes that we have picked to date, because I want you all to guess! What I can’t wait for, is what the “final” total will be when the season comes to an end. All I can say, is that for the past week or so, I have picked at least 50+ Juliet Tomatoes and about 13+ Big Boy Tomatoes each day! Yes, you heard that correctly! 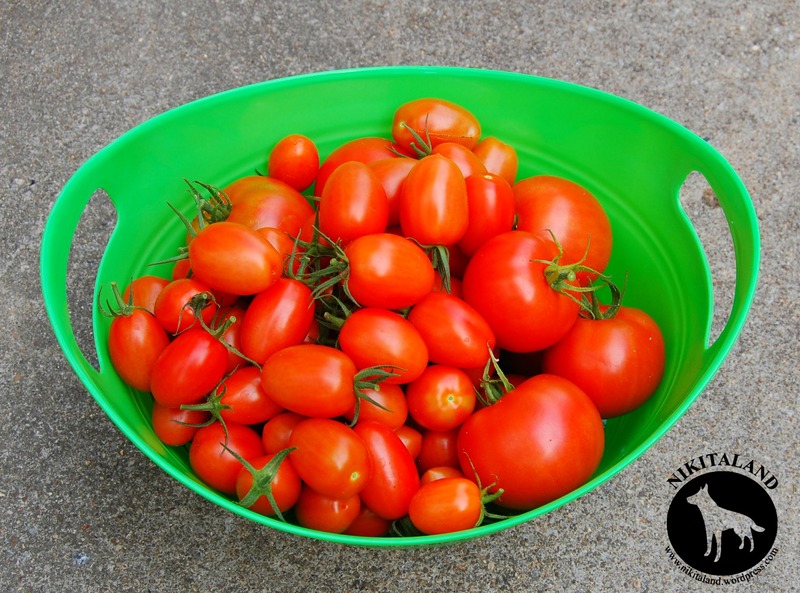 So, just imagine after three days of heading out to the garden, I have picked more than 150 Juliet Tomatoes! It is amazing, and we are definitely going to be planting these again next year. We have kept Grandma & Grandpa fully loaded with tomatoes for sure this year! 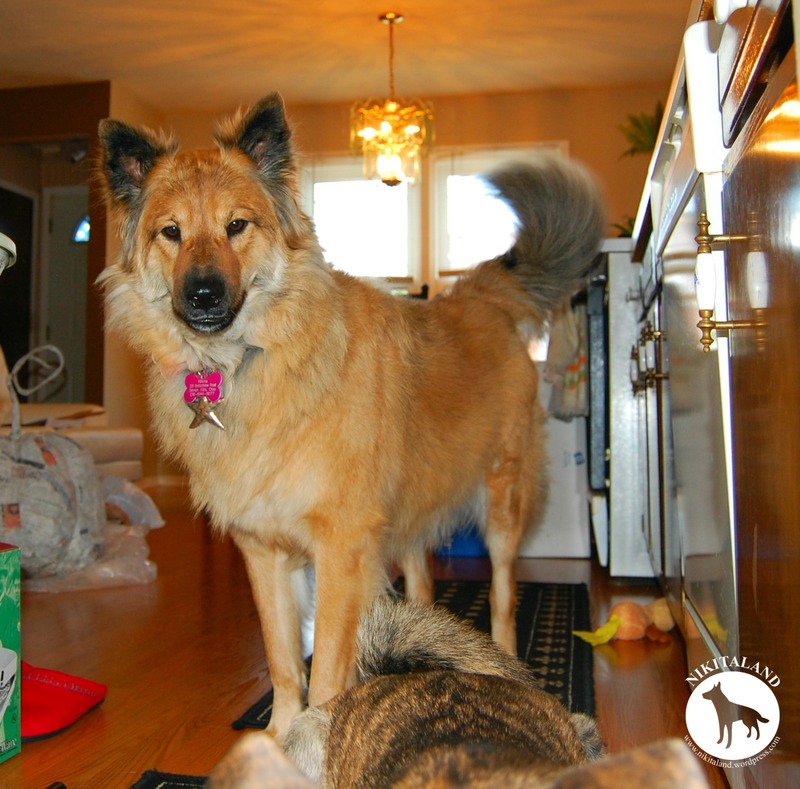 Nikita and Bella have been silly again, but that should not surprise you in the least. 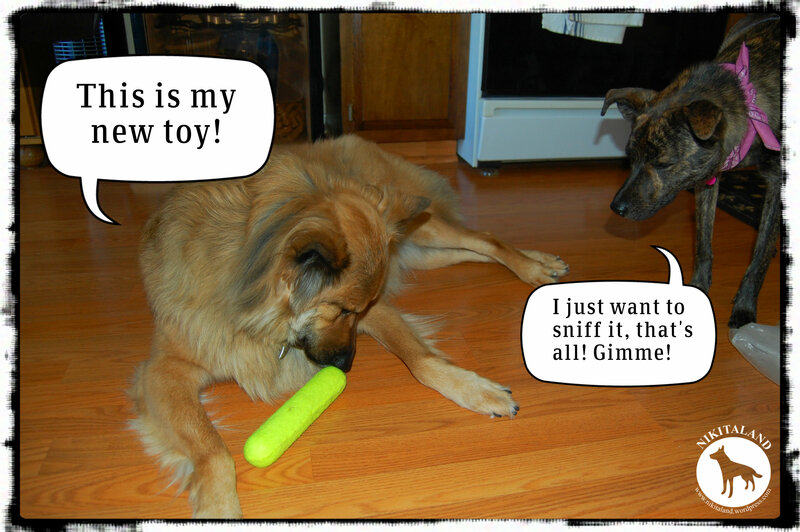 I got Nikita a new toy yesterday and she would not let Bella even come near it. When Nikita took a nap, she would tuck her new toy under her leg or under her head to protect it from being stolen by Bella. Don’t think that Bella did not try to snag it, as she put in a good effort all day. 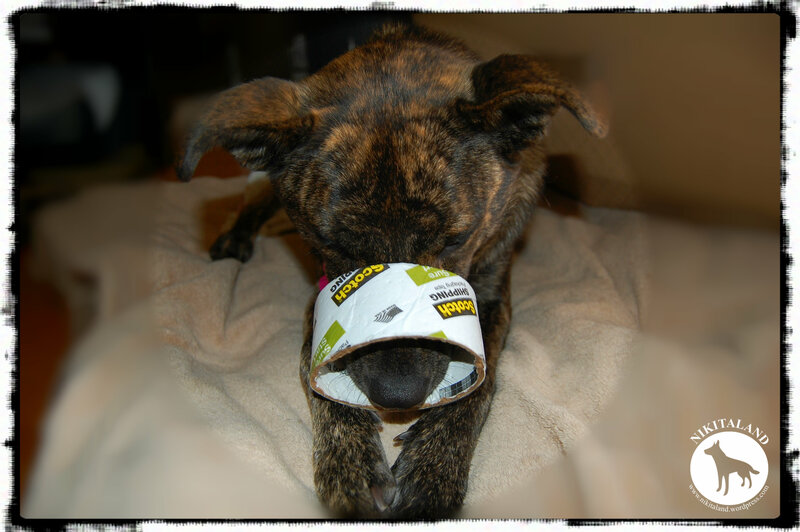 Came close a few times though, so Bella had to find other things to amuse her, like my roll of packing tape! When she got her hands on that roll, there was no giving it back to me. One of the funniest things that I heard this week was a comment that our UPS driver said. He dropped off a package the other day and he said to me “It’s about time to decorate the yard isn’t it?” Now that is hilarious that even he knows how much we love Halloween! It does not surprise me, or probably you if you know me, that Halloween snuck into my weekend in a big way. You all know that I have been busy working on all of my paper mache pumpkins and paper mache fireplace, and this weekend I kicked it up a notch and got the chance to get some painting done. 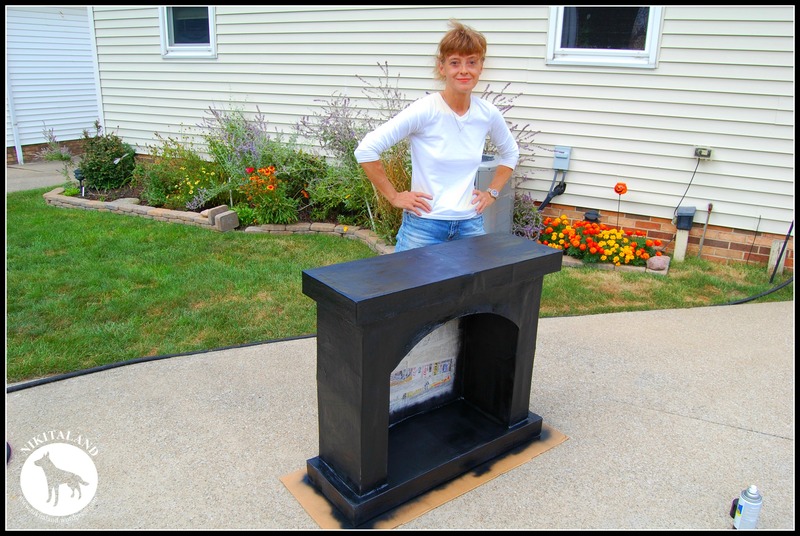 I got the final black coat of paint on the fireplace and let it sit out in the sun today to dry. I missed the entire Brown’s home opener game, but that’s ok as I heard that they lost in a big way. (does not surprise me at all) We went to Pat Catans craft store this weekend in the hopes of finding a diamond stencil to use on the front & sides of the fireplace, and we had no luck. So instead, I found a Zig Zag stencil that I am going to use to stencil a white zig and a lot of zags across the fireplace. I can’t wait to get started working on the stenciling part, so hold tight for a little bit to see the results! As for my Jack Skeleton paper mache pumpkin, I had to cutout a slit in the bottom of the pumpkin so I could get the camping light inside. The hole I originally cut was only just big enough to pull out all the stuffing, but not big to insert the camping light, so I had to make a little tweak to getting the light in. 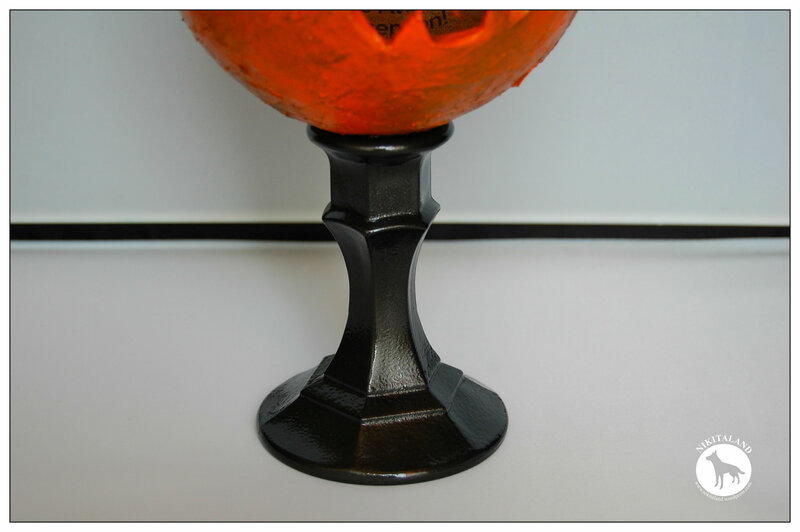 I spray painted the first coat of Rustoleum Marigold inside the pumpkin, as I have read that you should use a color that is bright so your light glows brighter. 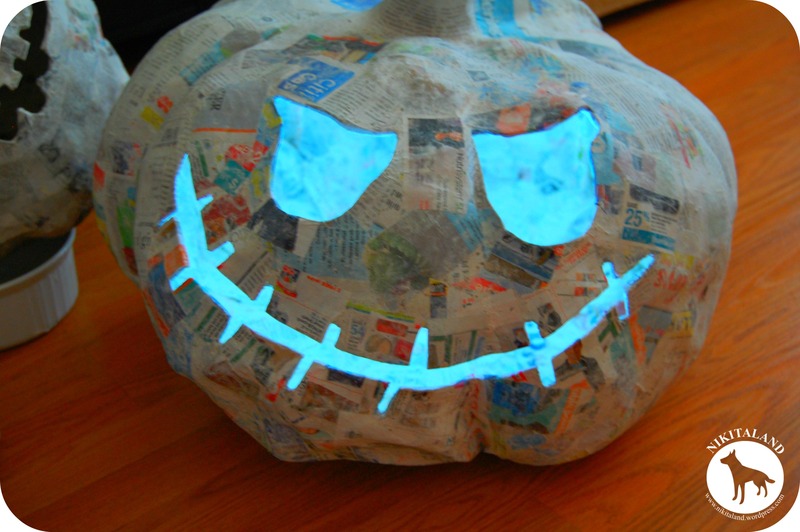 I then lightly spray painted the outside of the pumpkin black so it covers the newspaper well. I will then spray paint the pumpkin orange on top of the black to finish coloring the pumpkin. After these colors dry, I will seal the pumpkin both inside and out with a clear sealant. Our Jack Skeleton pumpkin almost caught on fire tonight too when I put the camping light inside of it. 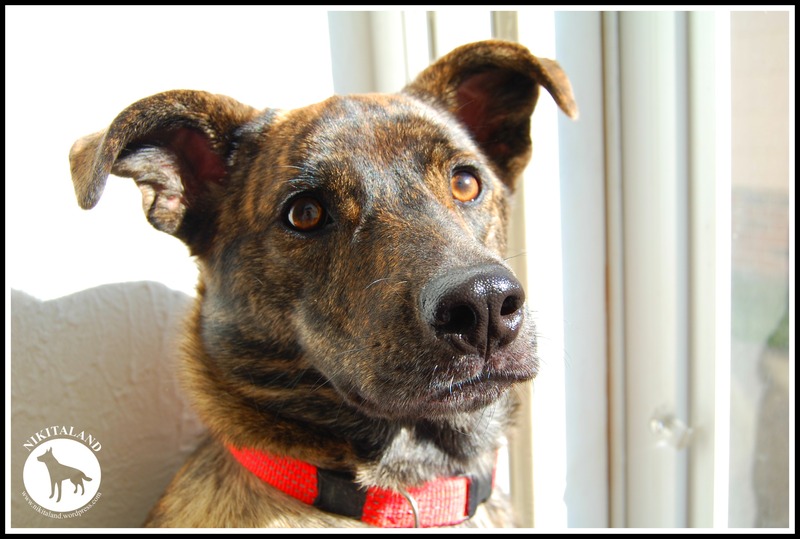 I turned on the light and walked outside to take a photograph to see how the Marigold color looks and when I came back into the house to set my camera down, I turned around and smoke was coming out of his eyes! I ran to Jack and saw that the camping light was smoking and got my Sweetie to pull the light out. We switched batteries in the camping light from regular AA batteries to a Lithium battery and they must have been too much for the camping light as it got fried. So now we need to head back up to the Dollar Store to purchase another one. Thank God the pumpkin did not catch on fire with all the fresh spray paint on it! 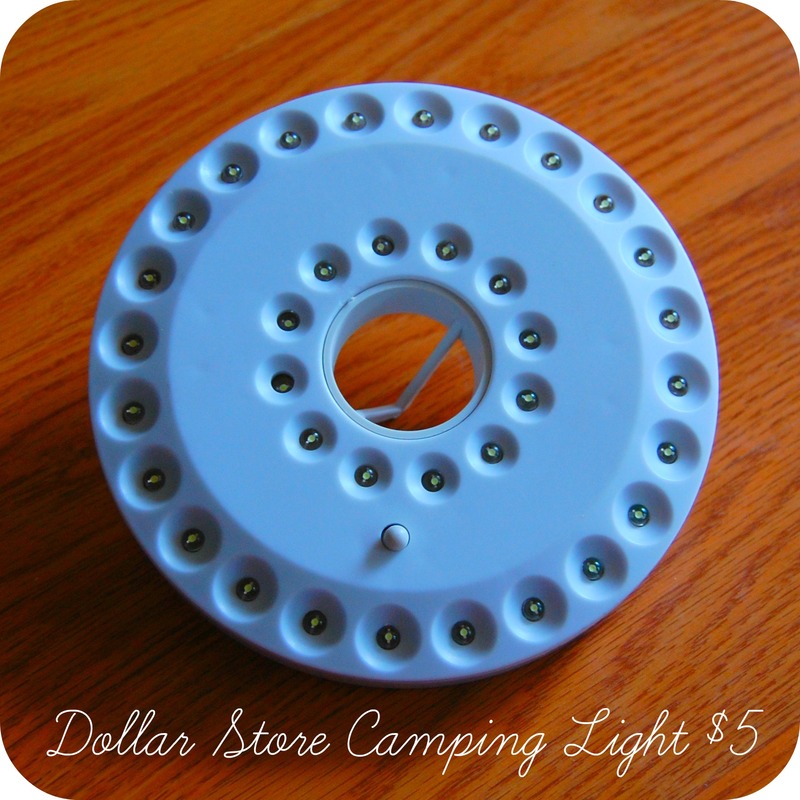 When we get a new camping light, we are definitely only going to use regular AA batteries in it this time! 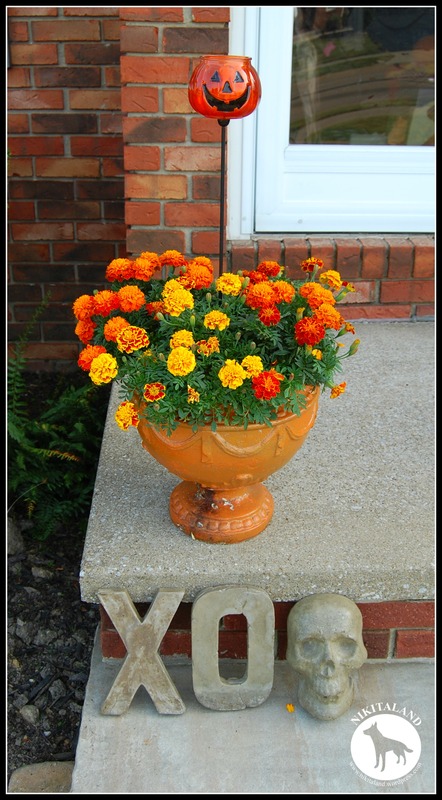 Our front porch has a little Fall coloring going on too, as our Marigolds are blooming in bright colors and I added our little glass pumpkin to the planter and lit a tealight in it tonight. Right on the step of the porch sits my cement X & O and cement skull to add the perfect touch! And just when I thought the weekend was over and all the Halloween stuff was done, evening set in and provided yet another remarkable Halloween scene. 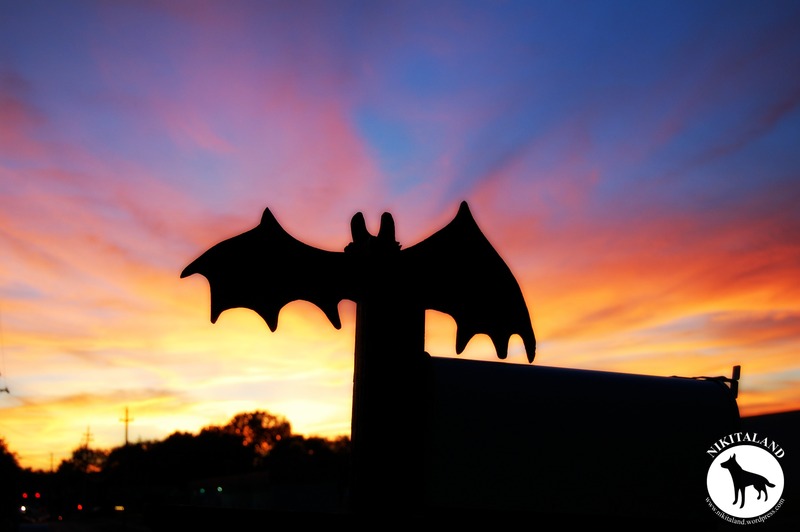 The sun was setting in beautiful colors that illuminated the black wood bat that proudly is perched on top of our mailbox post. What a great weekend we had full of Halloween! I wonder what next week will hold for us?! 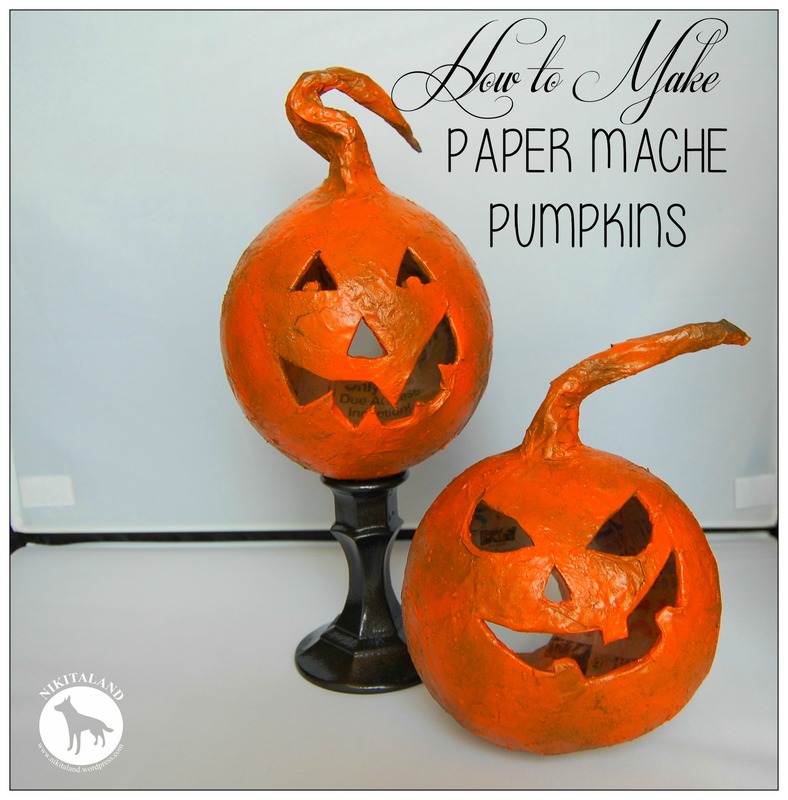 How to Make Paper Mache Pumpkins & More! 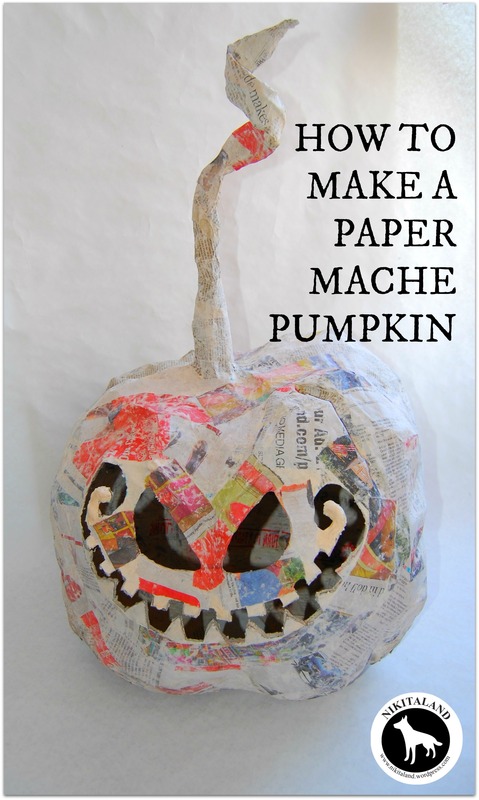 Let’s get down to business… so you want to learn how to make a paper mache pumpkin? You’ve come to the right place, so let’s get started. 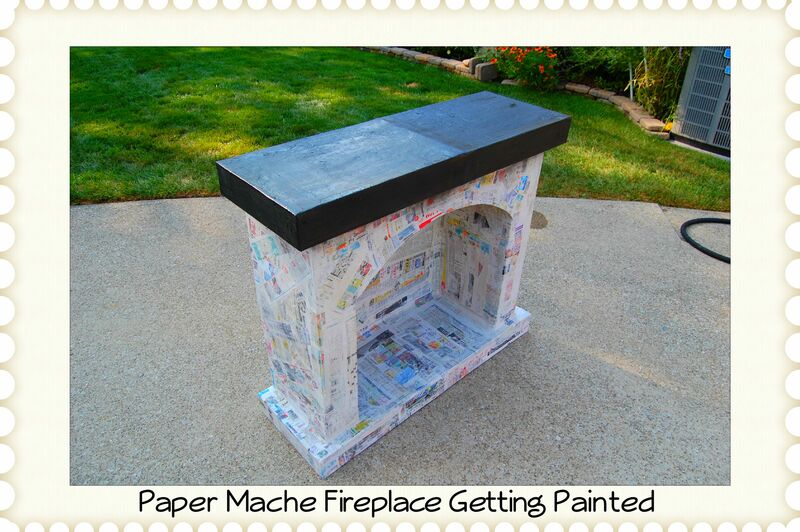 That’s all you need to create anything in paper mache! And you thought it was going to be hard to do. I’ll be honest with you, it is not hard at all, but it does take time…. drying time, that is. 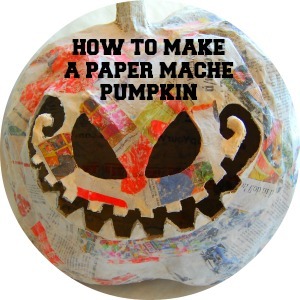 If you are sitting here reading this post and have even slightly considered trying to make some (or one) paper mache pumpkins for yourself for Halloween or even for your Fall decor, now is the time to do something about it! 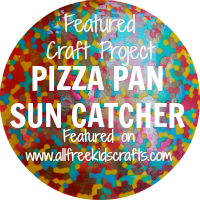 Creating paper mache objects is fun and easy to do with your family and kids, but I am sure that they will get bored easily when it comes to the “drying time” in between all the layers you need to put on. I hope that I can inspire you to create your own pumpkins for Halloween, and if you do, please share with me what you have made! 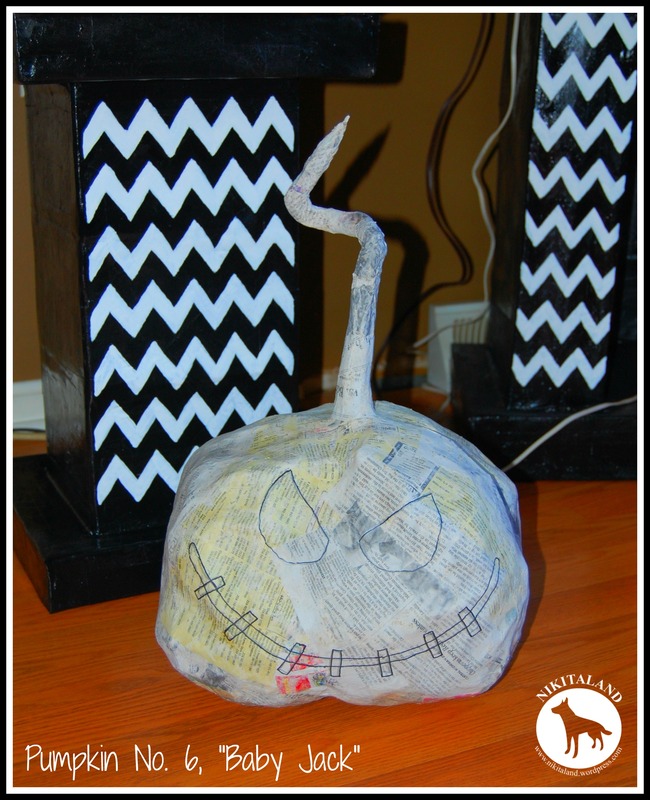 Creating paper mache pumpkins is a lot of fun, especially when you start to see your pumpkin coming to life, and well, actually looking like a pumpkin. I admit it, I start one pumpkin, and right after the first layer dries, I want so badly to paint it already, but know that I am not even close to being done yet, as it has many more layers of paper mache to go before it is completed. So you have the list of things that you need (above) to start creating your first pumpkin, so let’s begin…. Start with any sized plastic bag you wish. I have used those white tall kitchen bags, and even the large 33 gallon ones too, so it all depends on the what size of pumpkin you want to create. 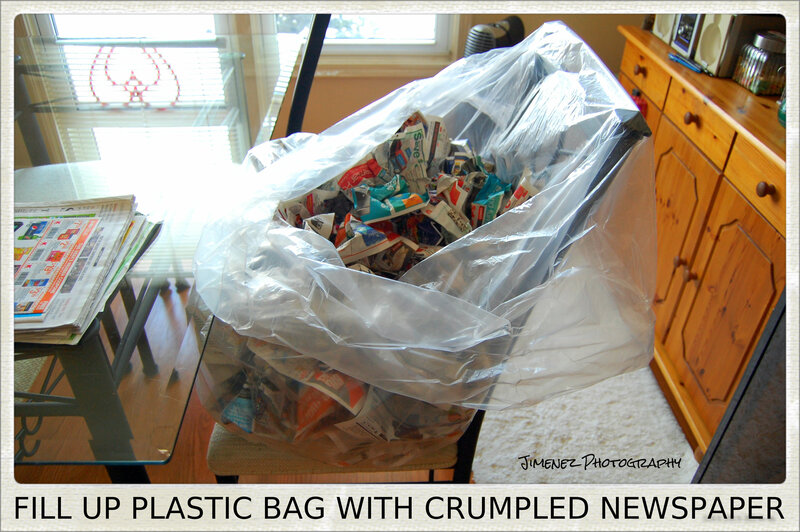 Once you have the bag filled with enough crumbled newspaper, you need to tie off the top of the bag. You can use the handles on the bag or just twist it at the top, or you could use twine or masking tape too. Now that your bag is filled and the top is tied, you need to create the stem for your pumpkin. I have used a few methods for a stem, but you can be creative in this step. Take a metal clothes hanger and snip off the top part. You will now be wrapping the metal clothes hanger around the top of your pumpkin to start your stem. (you can even poke the clothes hanger into the section where you tied the bag) Form the clothes hanger now into any “stem shape” you want. I have done some nice curvy stems with a clothes hanger. Just so you know the reason you are using a clothes hanger in this step, is because it will hold its shape when you start applying the paper mache to it. 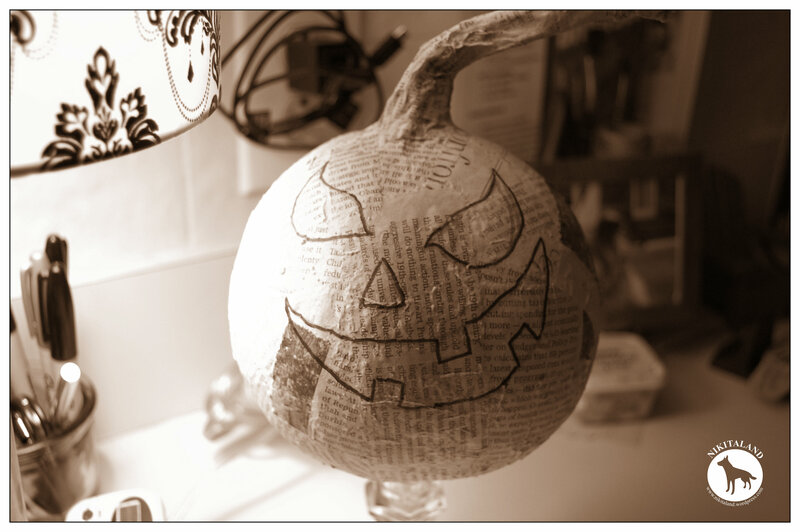 (believe me, on my first pumpkin I did not use a clothes hanger in the stem and just rolled up some newspaper, dipped it in the paper mache, and thought it would keep its shape. It did not) Any questions on this part, just ask me. Now, you have created your basic pumpkin form & the stem! I bet you are wondering what the string was for, right? Well, the string plays an important part in your pumpkin, as it creates the natural-looking pumpkin creases. You know what I’m talking about…those nice lines that run down the side of the pumpkin! Start by tying your end of the string to your stem. Pull the string down the side of your plastic bag (and pull kinda tight) and you will see a crease starting. Now, wrap the string up and around the other side, come up to the top (wrap it around the stem, again) and go down another side and up again, until you have created all the creases you wish on your pumpkin. Make as many as you want or just a few. Now you have created your pumpkin creases! Congratulations! 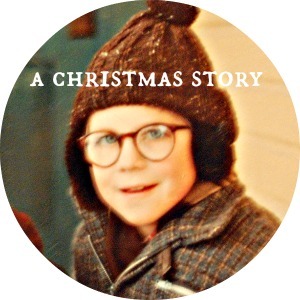 Are you excited yet? Now, it is time to start the paper maching process! Grab that large bowl, your whisk, and your bag of flour and head on over to your sink. Place your bowl in the sink, dump some flour into the bowl (you don’t have to measure the amount of flour you use) and add some water. Start whisking immediately! You want to add enough water (but slowly) to make a pancake-like thick (but not too thick) batter. Believe me, you will get better at mixing your batter with all the layers you will be adding, so don’t worry at this point, just make sure that your batter is not too thick or too watery. 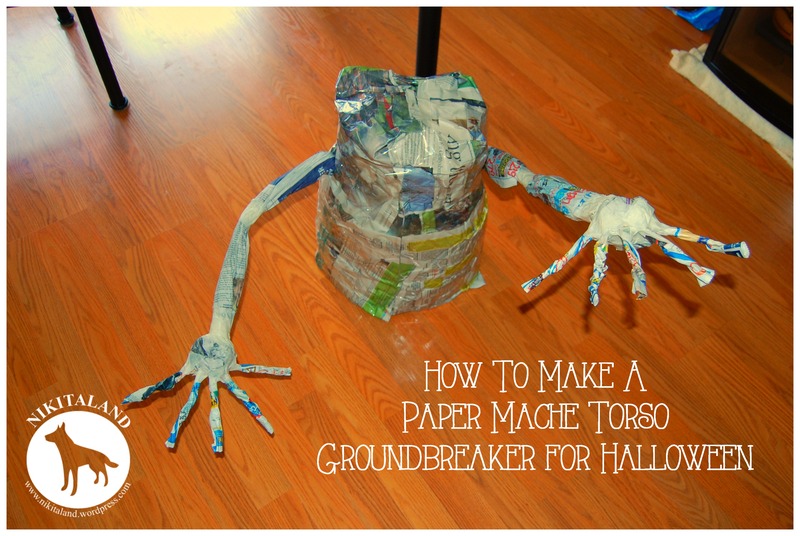 Grab that huge pile of ripped up strips of newspaper because you are ready to start paper maching your pumpkin. Make sure your pumpkin is on a plastic tarp or something to cover your floor, as this part can be a bit messy. Take one newspaper strip and lay it flat into the paper mache batter and either run the strip between your two fingers to remove the excess paper mache, or you can do what I do and run the newspaper strip up the side of the bowl and rub off the excess batter this way. 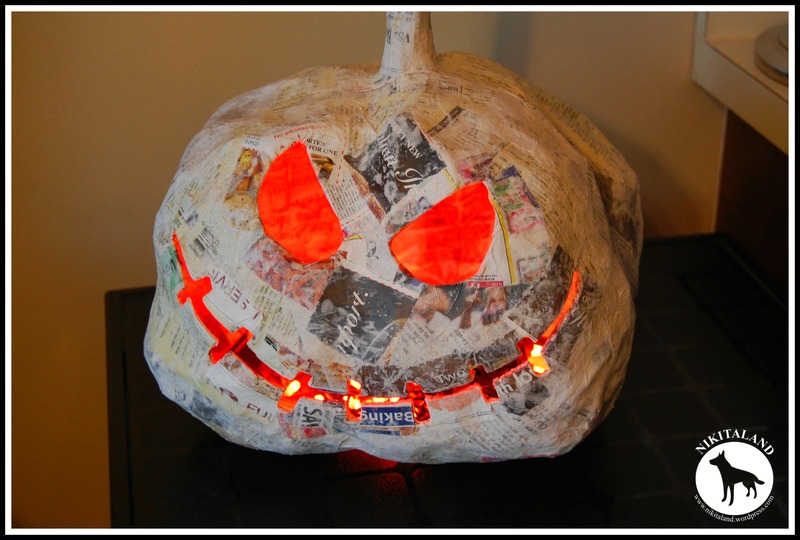 Now, just place your first batter-dipped piece of newspaper on top of your pumpkin. You need to always start at the top of your pumpkin and work your way down. Once you get one layer on the top half of your pumpkin, you need to let it dry or place it in front of a small heater like I do, to hurry along the drying process. 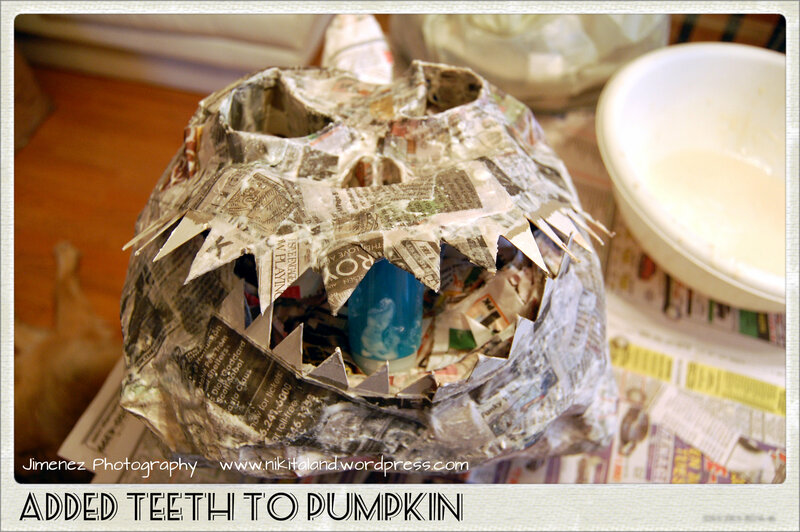 Then, you flip your pumpkin over and paper mache the bottom half, and let the bottom half dry. Once the entire pumpkin has one layer on it, and it has dried thoroughly, you will need to add more layers. 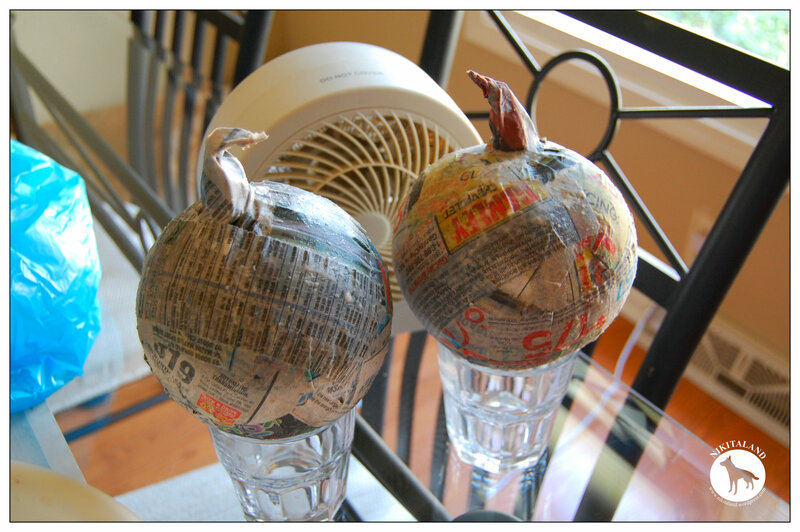 IMPORTANT TIPS: When adding your first layer of paper mache, make sure you use your finger tips to poke your newspaper strips nicely into the creases you made with the string. This part is important as it adds character to your pumpkin. Also, make sure you run your hand flat over each strips when applying them to squeeze out any excess paper mache batter. Always keep running a flat hand over your strips as you work your way around the pumpkin. Another good tip is to position your layers in different directions on your pumpkin, as this will add strength when it hardens. 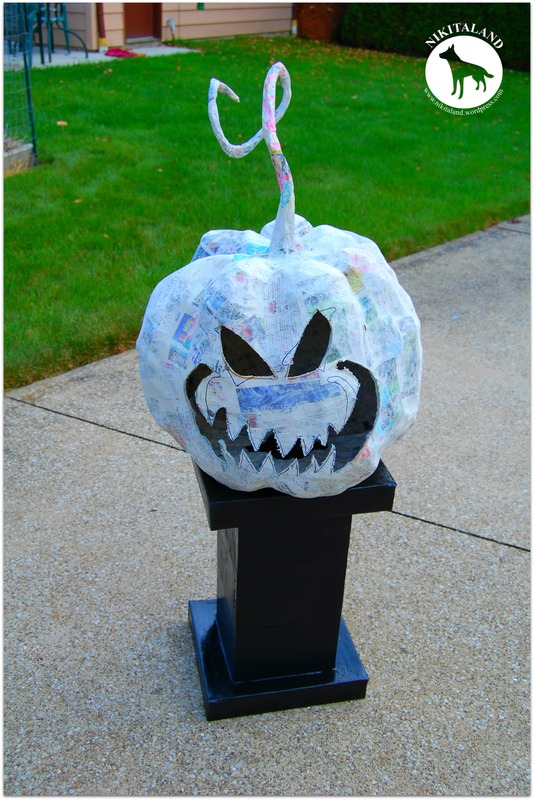 I have had a lot of people ask me the question “How do I know if I have enough layers of paper mache on my pumpkin?” Well, that is a good question and can be easily answered. 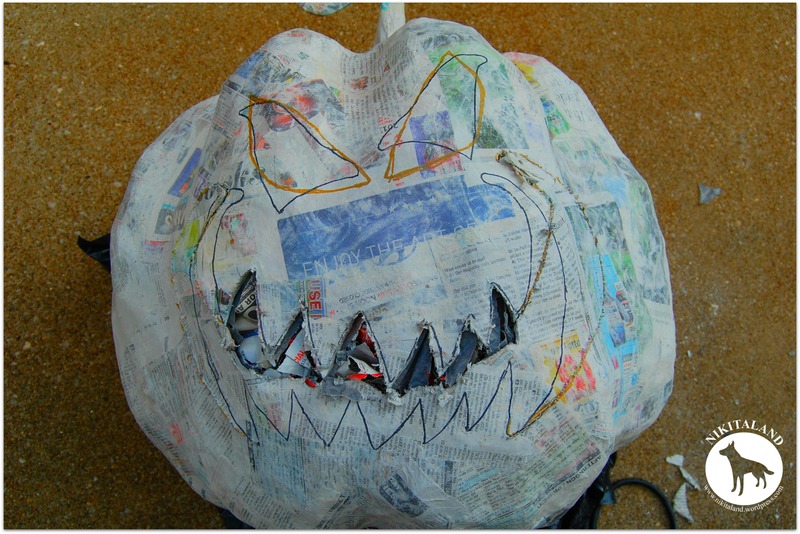 After each layer of paper mache has dried, gently push down on your pumpkin all around and if there is any “give” on the pumpkin….. it needs more layers. Your completed pumpkin should be very hard when you tap or knock on it. When you have completed your paper mache pumpkin and feel that it is hard enough with no “give” on any part of it, it is time to cut out your face. Look at your pumpkin. Twist it around to see what side looks best to cut out a face on it. Once you find the side you like, simply draw a face on the side of your pumpkin with a pencil. Start off with a pencil so you can make changes if you don’t like what you drew, then go over your pencil marks with a Sharpie Marker when you are satisfied. I used to cut the faces out of my pumpkin with an Xacto Knife, but ever since I have increased the layers on my pumpkins to make them thicker, I found that an Xacto Knife was too hard to use. So, I resorted to my trusty Jigsaw. On my pumpkins, I just drill a hole large enough for my Jigsaw blade to fit in. You could also use a Dremmil too if you have one to cut out the face. 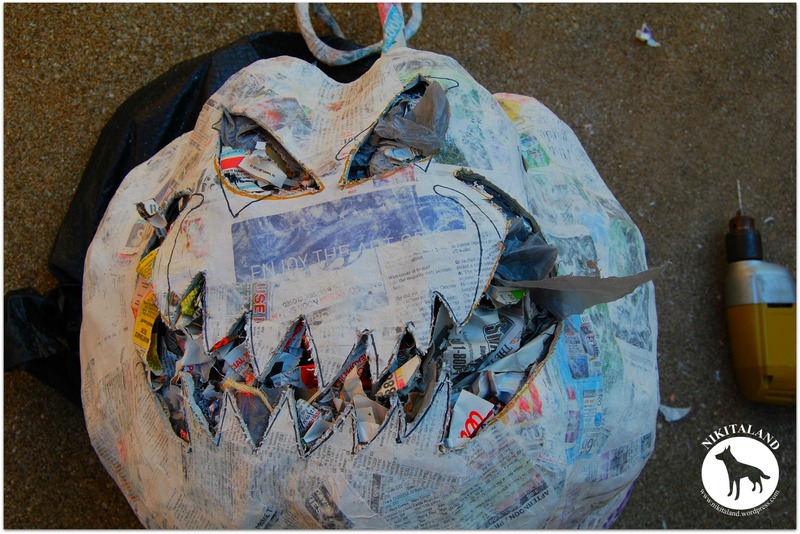 Once your face is cut out, you will now need to REMOVE all of the newspaper stuffing & plastic bag from inside your pumpkin! The reason you do not remove the stuffing before is because the stuffing is holding the shape of your pumpkin. 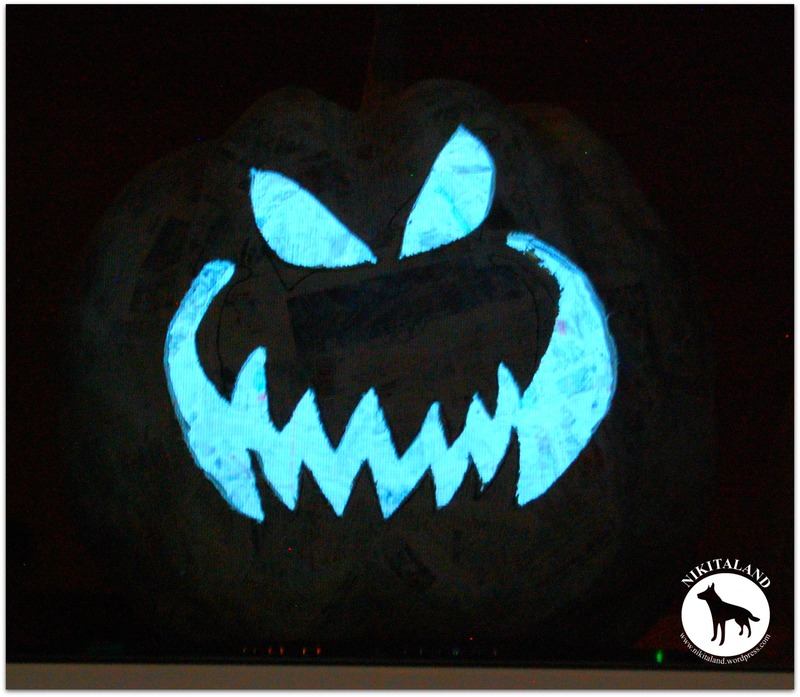 You will need to get your Xacto Knife or Jigsaw and cut a circle on the bottom of your pumpkin. This is where you will pull all of the stuffing out from. 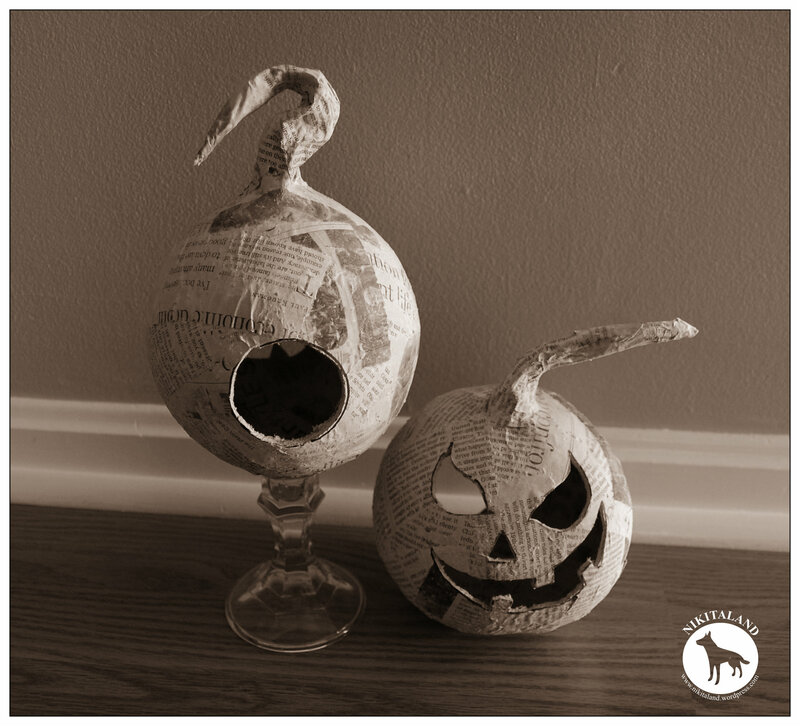 Remove all the newspaper (and keep the stuffing too, so you can use it on your next pumpkin) and carefully pull the plastic bag out too that is now stuck to the inside of your pumpkin. The string is probably stuck to the inside sides as well, and you can remove that too, but be careful when pulling this out, as you do not want to damage your pumpkin. Make sure that everything is cleaned out from the inside of your pumpkin at this point. You will need to add more paper mache strips around the cutout face edges to finish off the edges nicely. 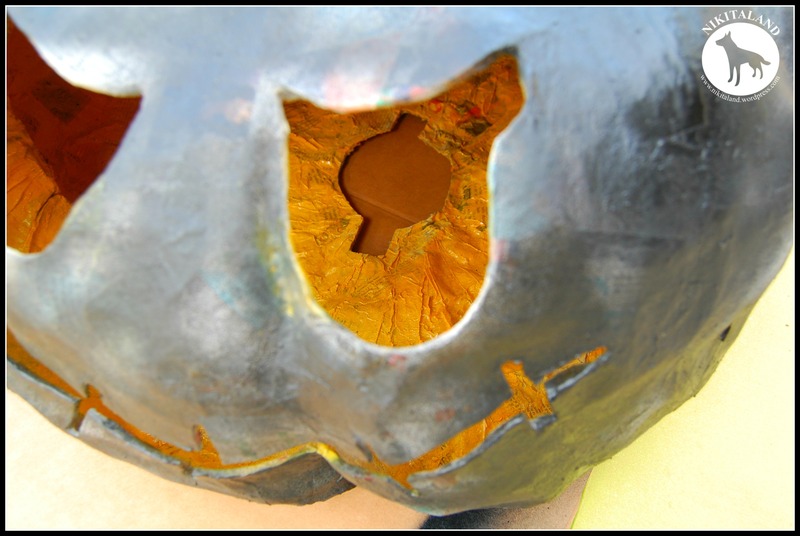 The hole at the bottom of your pumpkin will be used to place your battery operated light inside your pumpkin after you paint it. 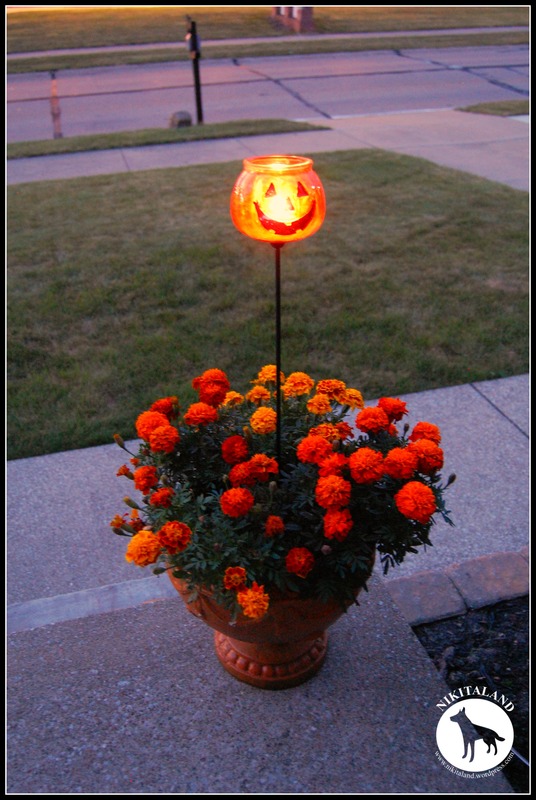 I was going to use these small battery operated LED lights that I have, but realized that I wanted more light to make my pumpkins glow. I found a round Camping Light at the Dollar Store for $5 which has different light settings and is brighter than the other LED’s, so this is what I will be using in my pumpkins. Yeah, it’s finally time to paint your pumpkin! Congratulations! You have accomplished a lot, but have created a one-of-a-kind pumpkin that you will cherish forever! Take your pumpkin outside for some good ventilation, and pick out the colors you want to spray paint it. TIP: I have learned from some experienced pumpkin creators, that you should spray paint the inside of your pumpkin yellow. They use yellow inside their pumpkins so when lit, it makes them glow better, but you can use orange or whatever color you choose, as this is YOUR pumpkin. I would spray paint the inside of the pumpkin first, let it dry. 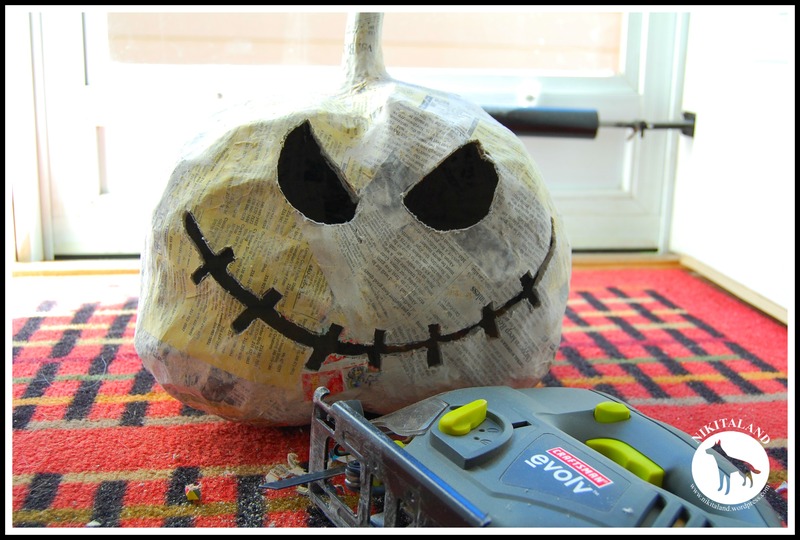 Then place some newspaper inside the pumpkin to cover up the face holes when spray painting the outside, as you do not want any over spray to get inside. 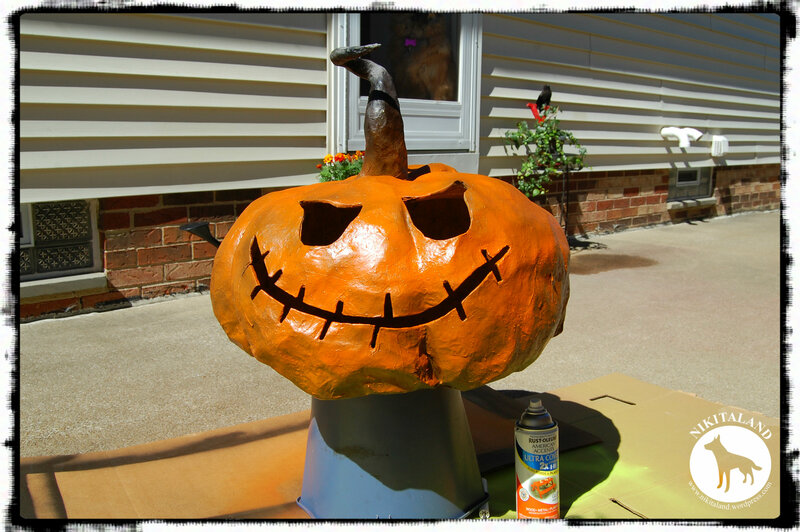 Once the spray paint has completed dried, spray a clear coat over the entire pumpkin, both inside and out. You are now officially ready for Halloween! These are the pumpkins that I am currently working on, in various stages (and I am starting on a new one today too). Just starting to paint the fireplace. As you can see from above, my huge Jack Skeleton pumpkin has the camping light inside of it. Isn’t it bright? Stay tuned, as I work on finishing all of my pumpkins, the fireplace, and the paper mache witch that I am currently working on. You will be amazed at the end results! I know what you’re thinking, what are you doing talking about Halloween in July, right? Well, we LOVE Halloween and it takes time for us to prepare anything new for our Home Haunt, so we have to start early. 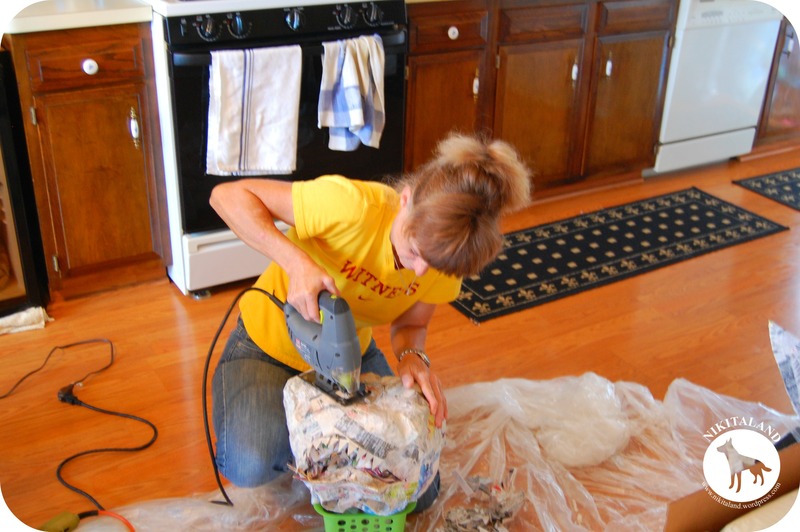 Paper Mache projects take a lot of time, with all the layers you need to attach, and with each layer, you need to do a lot of waiting to make sure each layer dries thoroughly before the next one is placed. 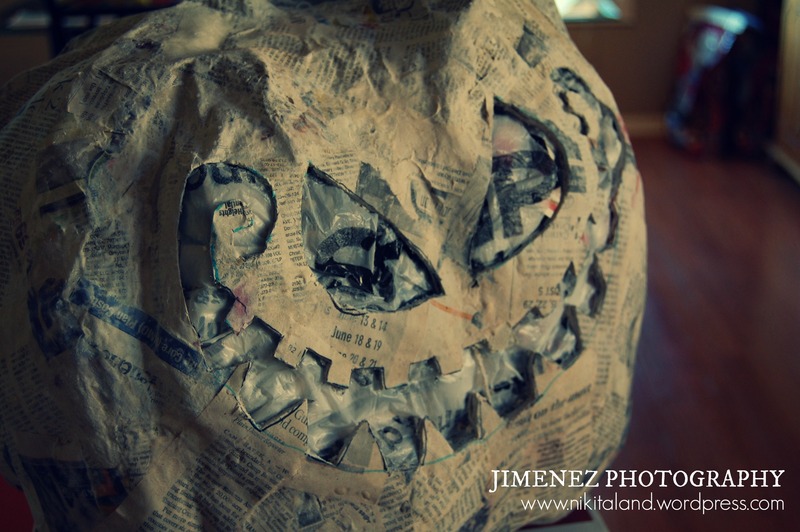 To start making a paper mache pumpkin, you can use whatever form you want, but I start usually with a large bag and fill it up with balled up newspaper or any other filling you can find. Then, once the form is made, I take string and pull it up along the sides to make those nice indents along the sides of the pumpkin. Next, you need to decide on how you are going to create the stem. Sometimes, I just tie up the top of the bag for the stem and paper mache over it, other times, I take some newspaper and wrap it around a piece of wire so I can bend the stem in a funky shape. 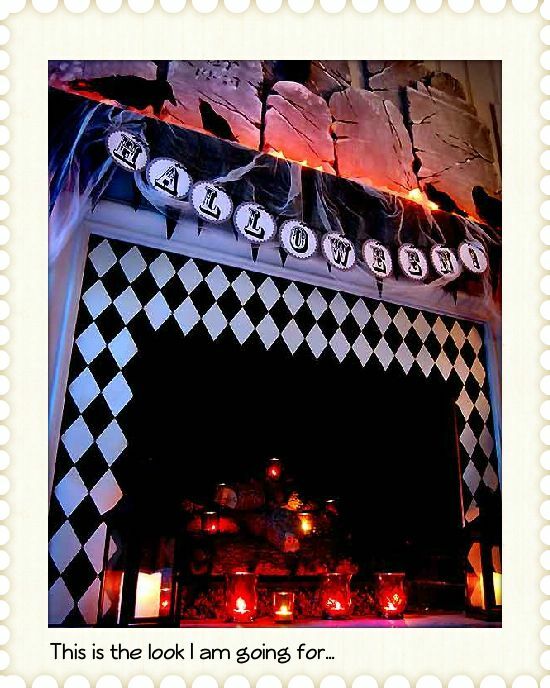 I am currently working on a Haunted Fireplace for us to use either in the house as a decoration, or we can use it outside on Halloween night for another prop. 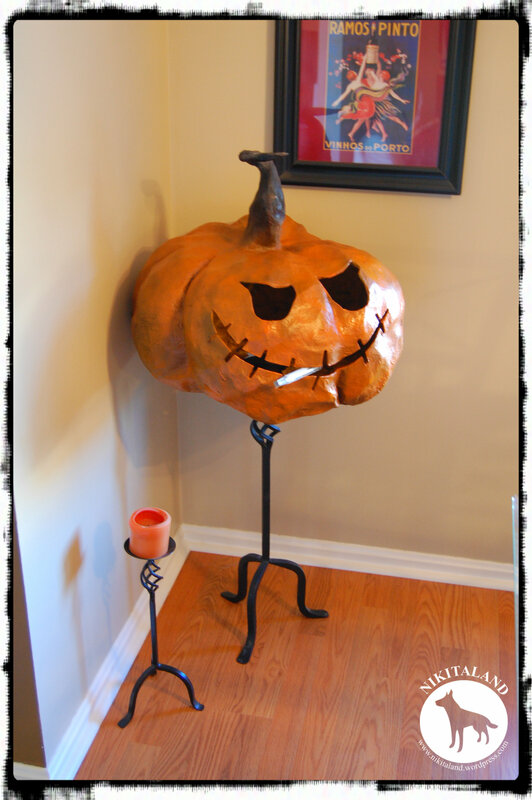 I am planning on setting some of my paper mache pumpkins on top of the mantel of the fireplace when I am done for a nice effect. 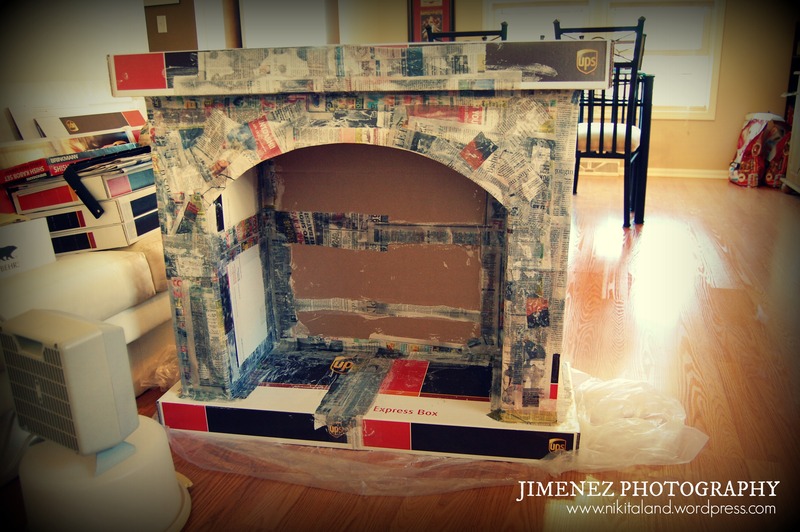 The one thing that I will need to work on and figure out how to do this, is to create a fake fire for the fireplace. I have seen some neat effects of people using an old wire garbage can, a small fan, some red & orange lights, and some pieces of material. The concept of this is to place the fan in the bottom of the garbage can so it blows upward and “moves” the pieces of material cut into flame shapes while the red and orange lights create the color of fire. We’ll see if I can get this to work, when I get to that point or step in my process, but it surely will be interesting if I can pull this off. 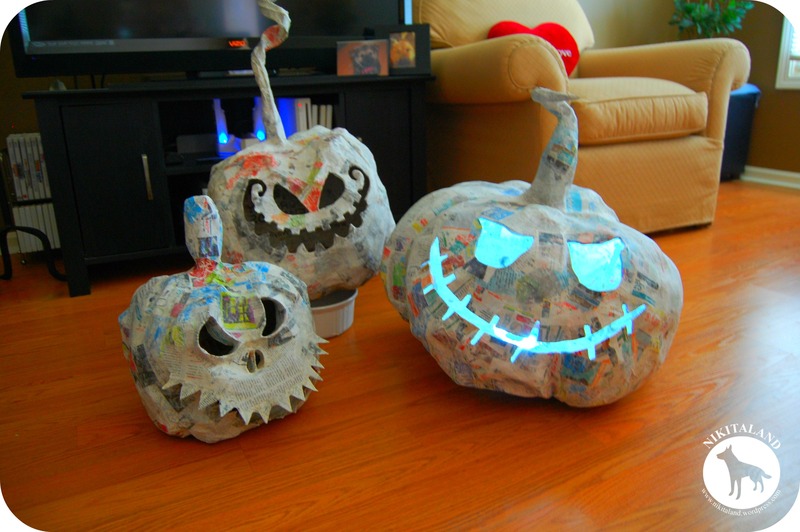 If anyone would love to do some paper mache pumpkins for Halloween and need some help getting started, let me know and I will be more than happy to assist you. I am far from being an expert on this, but with the more items that I make, I am learning some neat tricks along the way. February just started, but the dreariness of winter has taken over. The case of stir craziness of being cooped up in the house has already happened. Being able to head outside without being all bundled up from head to toe seems like a dream right now – – oh, I miss those flip flop days. And I found out over the weekend that nine inches is too much. Too much snow, that is. 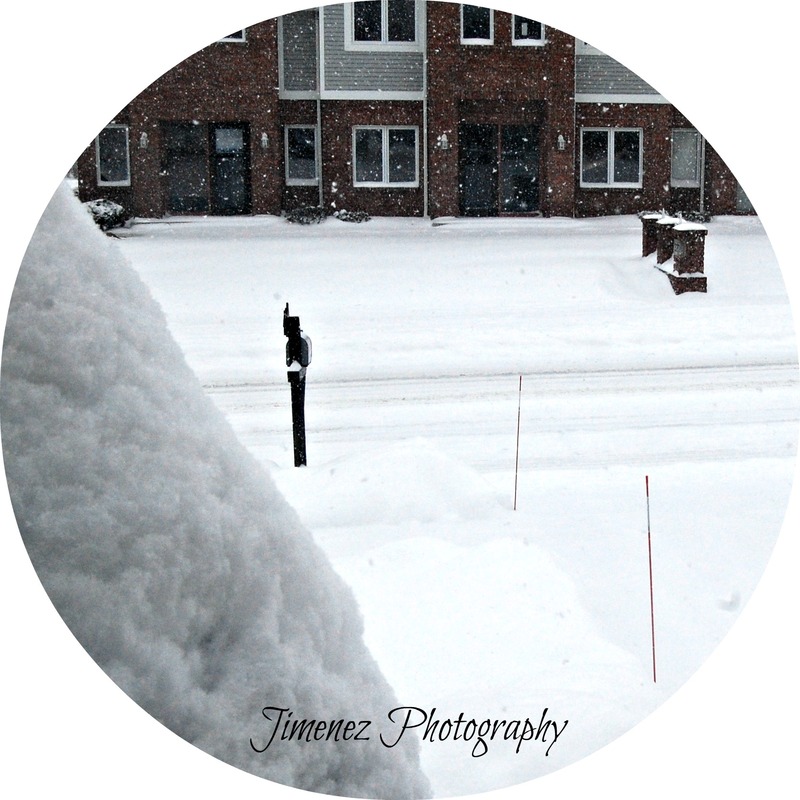 It was beautiful to watch it snow the entire day on Saturday, as it covered basically everything with that light airy fluffy snow, but within an hour or so, three or more inches fell, and it kept falling the entire day to approximately nine inches in our area. We are thankful that it was not a heavy snow because keeping up with clearing the driveway was a chore already. I did though, by accident, find out that I could use our leaf blower to blow some of the snow off the driveway since it was fluffy, so that helped a lot with the snow removal, but I could not use it on the entire drive as I ran out of extension cord. Rats. 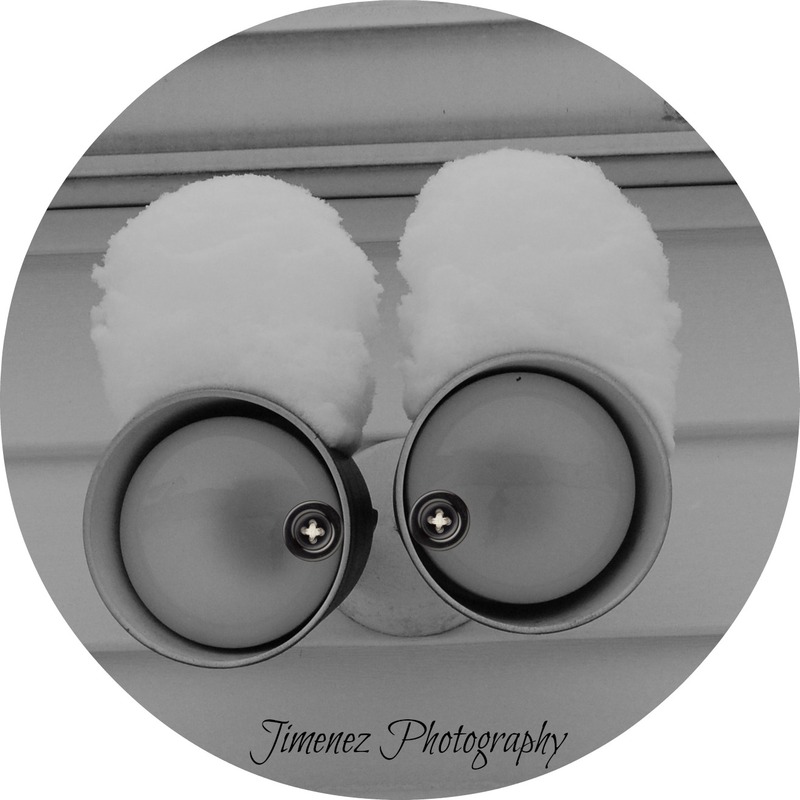 So, what do you do when you are stuck in the house watching it snow? You play with the dogs! They enjoyed all the new fallen snow as they ran like Tasmanian Devils through the snow piles and came back in the house with their fur all matted and wet. 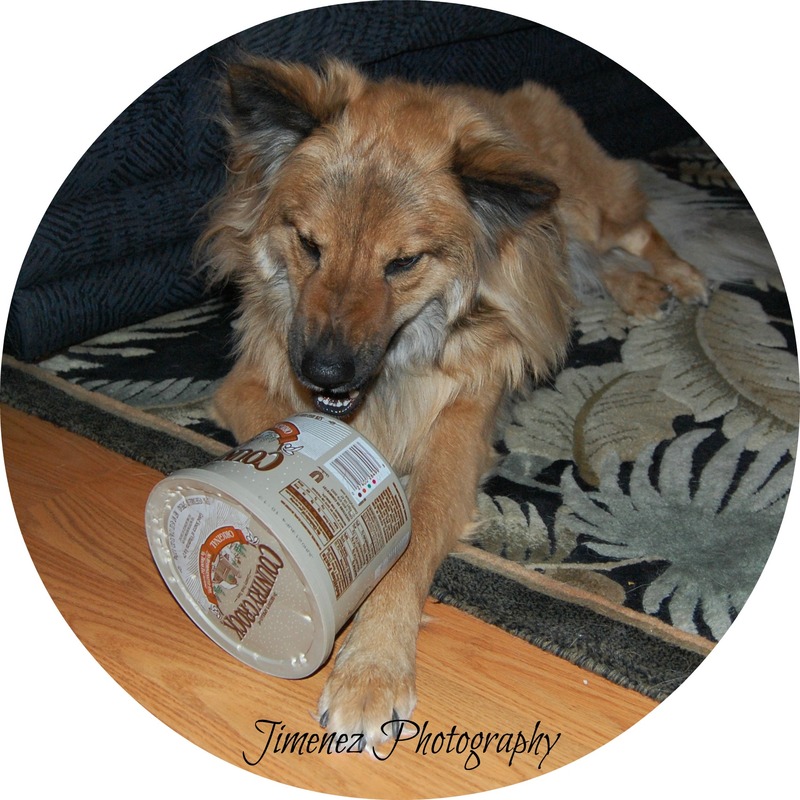 Pure joy is what it was to them, but nap time quickly followed but not before Nikita beat up a butter tub really good. 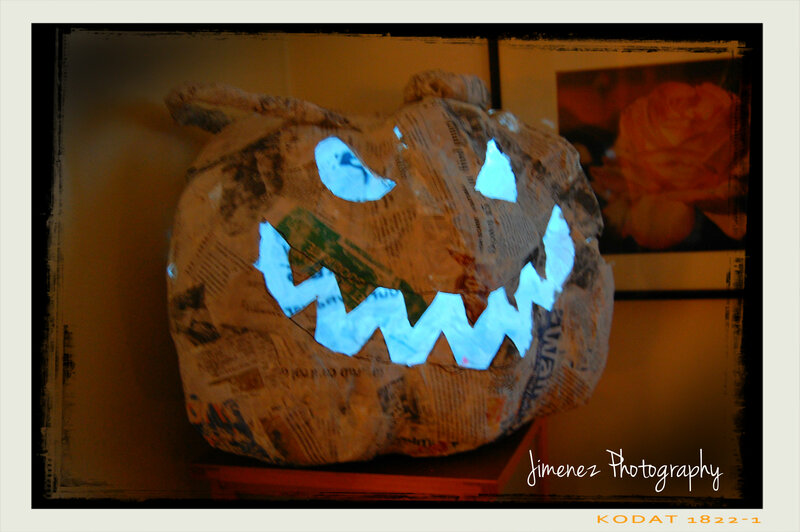 While the dogs napped, I took it upon myself to tackle yet another paper mache pumpkin. 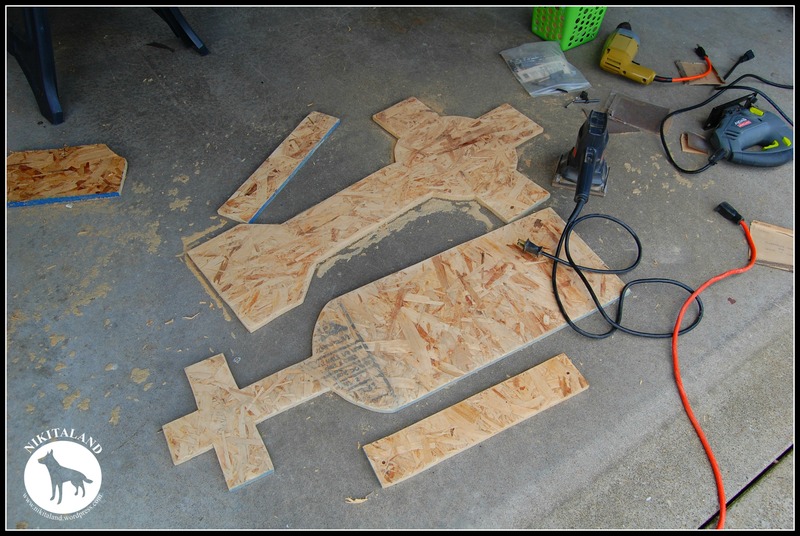 This time, I am attempting to make an enormous one that hopefully we will be able to use as a prop for Halloween. 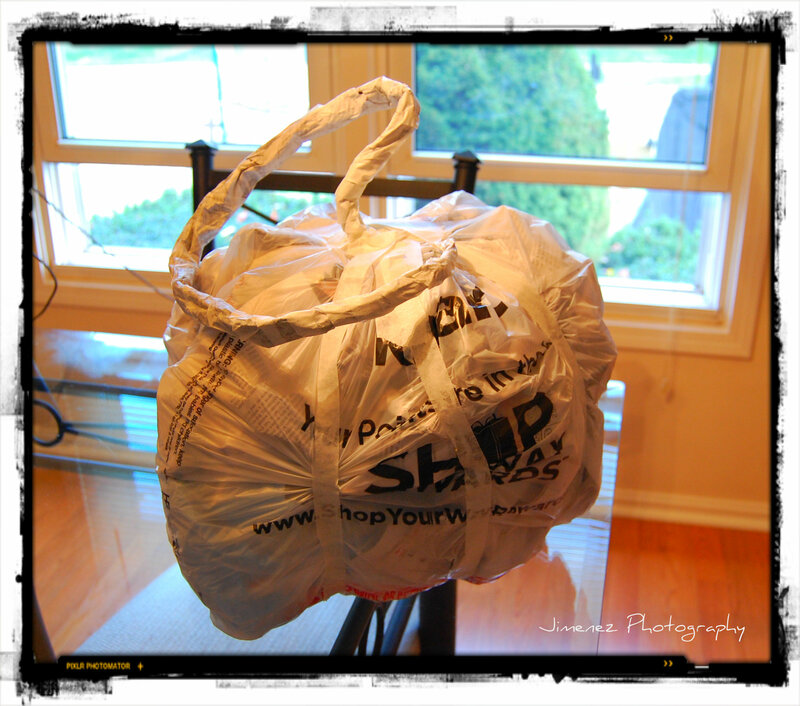 I took a large clear garbage bag and crumpled lots and lots of newspaper and filled up the bag. 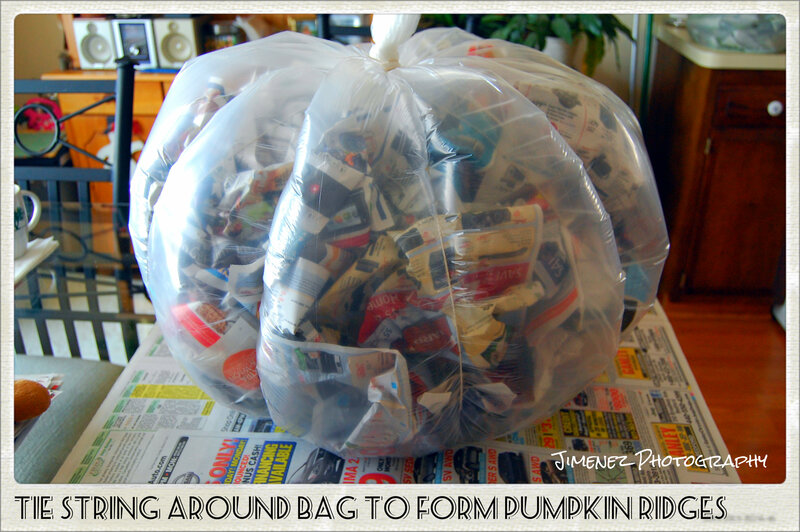 Once I had what I thought was enough newspaper in the bag, I closed up the bag with some air still in the bag to help keep the pumpkin form. After tying the top off on the bag, the next step to making a pumpkin is to pull a string around the form to make “indents” just like a regular pumpkin has. 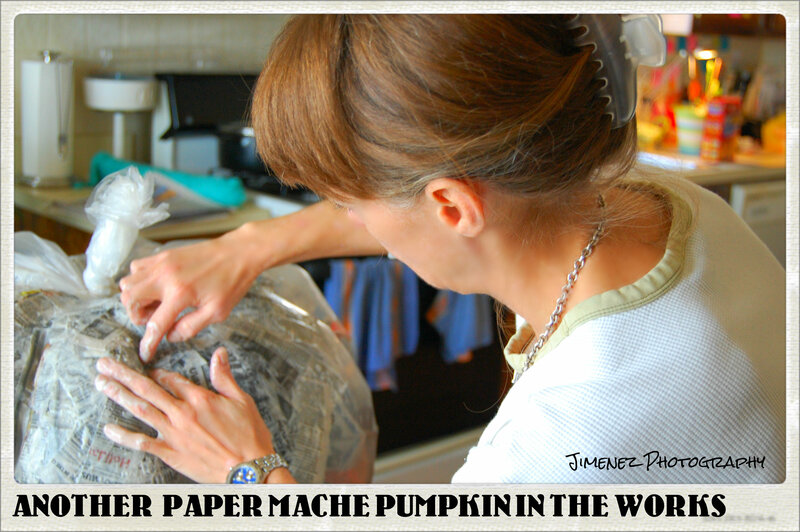 Once you have enough indents, just tie off the string and you’re ready to start the paper mache process! 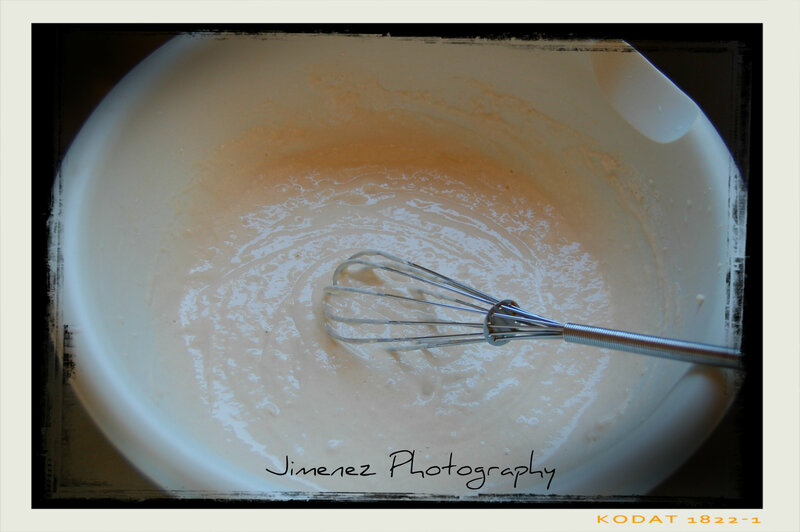 Just mix up some flour and water to make a pancake batter consistency and dip your newspaper strips into the batter. Run your fingers over each piece of newspaper to remove excess batter and place on your form. Starting at the top of your form, place strip after strip in different directions on the form until you get a layer across the top of your form, then work down the sides. You will need to let the top half dry first before finishing the bottom half. Once you get one layer done on your pumpkin, you will need to go over it again with a few more layers, drying each layer in between, until your pumpkin is nice and hard. Just waiting for pumpkin to dry. 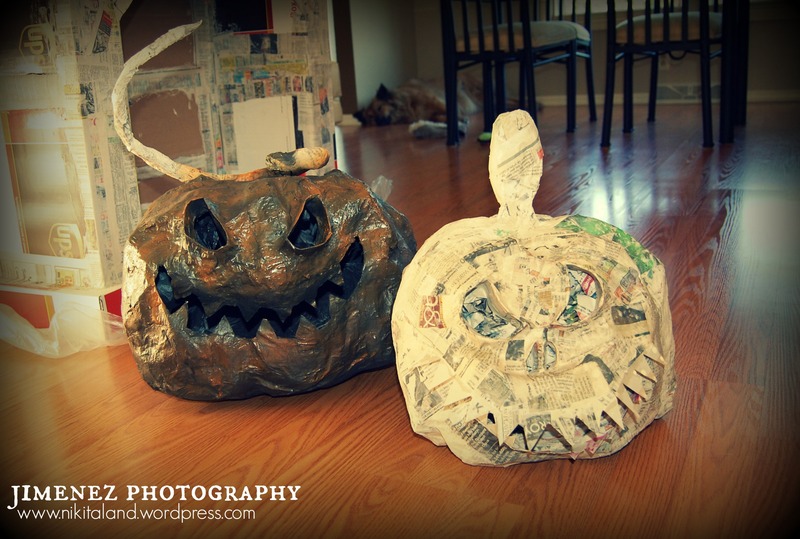 Making paper mache pumpkins takes quite some time from start to finish, and that is the reason I am making these this early in the year so I can have them ready for Halloween. By the time the witching hour arrives, I should have quite a stock pile of them ready! 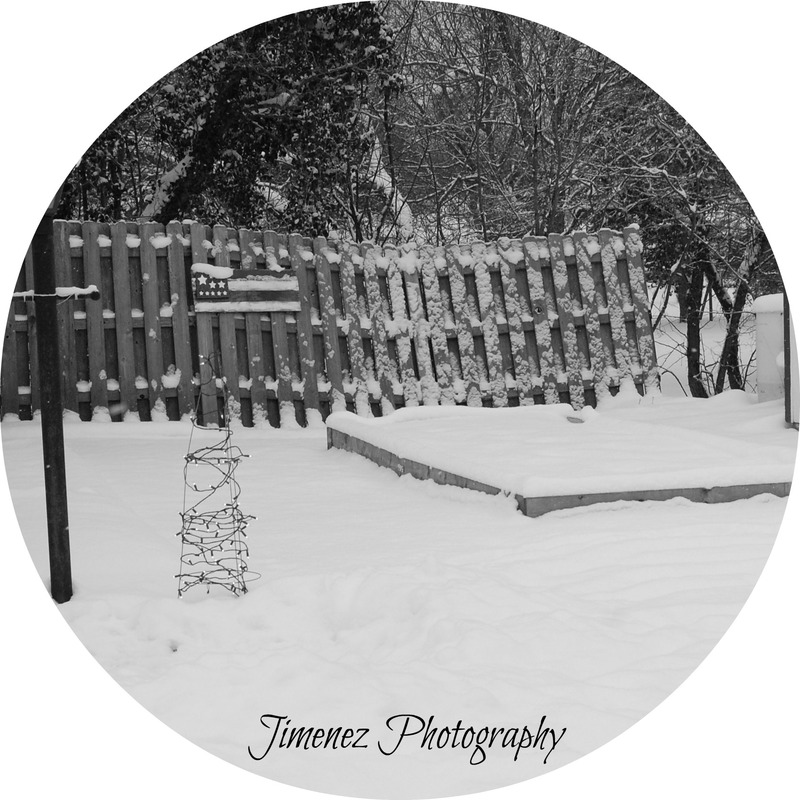 We had a nice weekend even dealing with all the snow we got, had lots of fun with the dogs, and even got some crafts done. But, we have the best dogs in the world that bring us so much joy and happiness, even watching them play with a butter tub makes you chuckle. 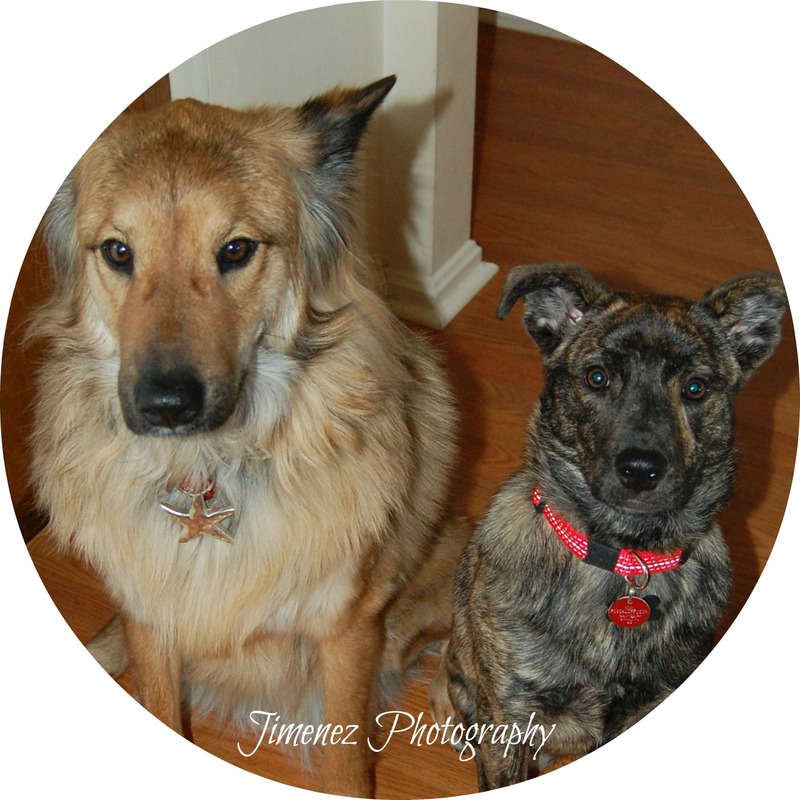 Silly dogs. Tonight is strange, and eerie. The streets are quiet, the rain has slowed down a little, everyone’s porch light is out – Halloween has been postponed until Sunday. This will be a Halloween that we will never forget, as Halloween night did not come as it should have, but it was delayed due to Hurricane Sandy. By now, we would have handed out close to 200 treat bags in our neighborhood, and we would be working feverishly for the next few hours to bring in all of our expensive props back into the house. None of this happened tonight. We had to pull up every one of our Halloween props that we had strategically placed in the front yard into the garage when the hurricane winds started. Now, over the weekend, we will try to recreate our graveyard for the trick-or-treaters that will arrive on Sunday. We go through all of this because of our love for Halloween, and because the kids love it. Being in the Halloween mood, I worked some more on my paper mache pumpkin today. I knew that I was not going to be able to get this project completed by Halloween, but I am determined to create a masterpiece, well perhaps a masterpiece in my mind, but you can tell me what you think. 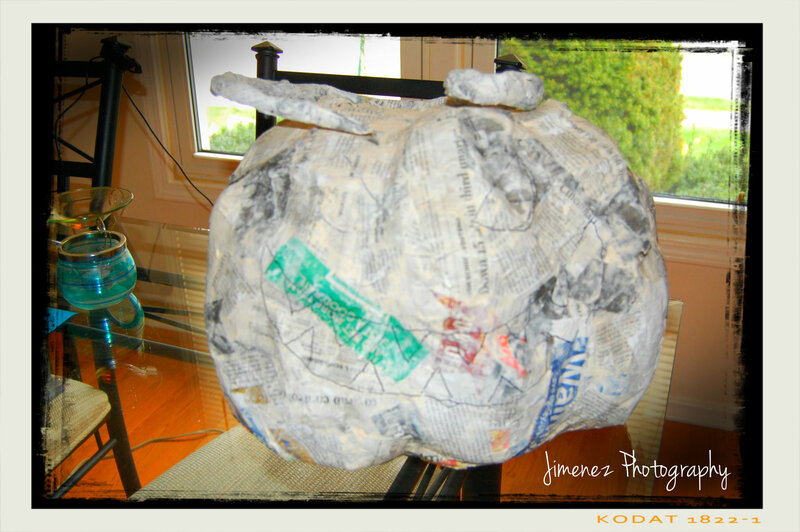 I started this whole paper mache pumpkin with a large plastic bag from the grocery store, then started filling it with more plastic bags and rolled up newspaper until I got it to the size I wanted then tied the bag at the top. Next, I took masking tape and pulled the tape from the top of the bag down to the bottom, making an indent in the side of the bag to form the side grooves of the pumpkin. I worked my way around the entire bag until I made enough grooves around the pumpkin. 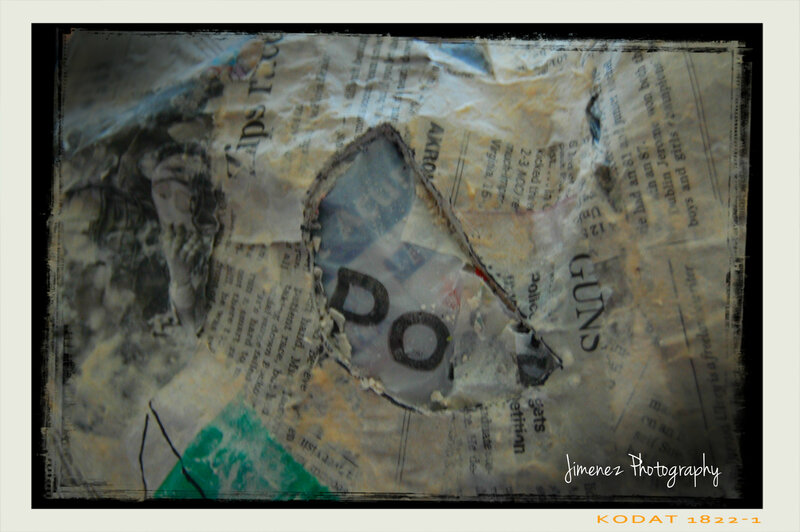 Next, I mixed up the paper mache mix and tore lots of strips of newspaper. Now the fun part begins! I dipped each piece of newspaper into the paper mache and then ran the piece through my fingers to remove an excess and laid piece by piece all over the plastic bag. 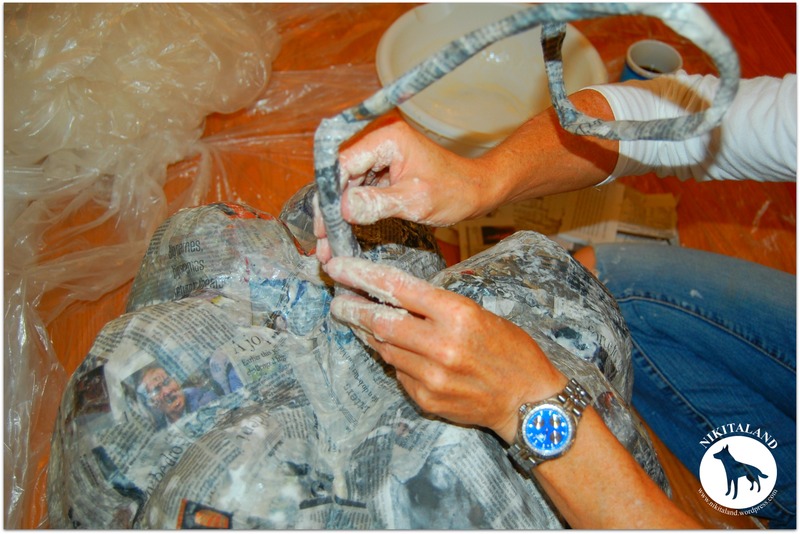 When you paper mache, you should always crisscross the pieces of newspaper on your form so it makes a strong bond. I kept working my way around the pumpkin until I got the entire top complete, then I let it dry overnight. Then, I flipped it over and did the same to the bottom, and let that dry. Now, I have a completed paper mache pumpkin that turned out nice and hard. So today, I decided that I needed to get to work on this project, and hand drew a face. Next, I had to cut out the eyes and mouth and I used a sharp knife to do so. 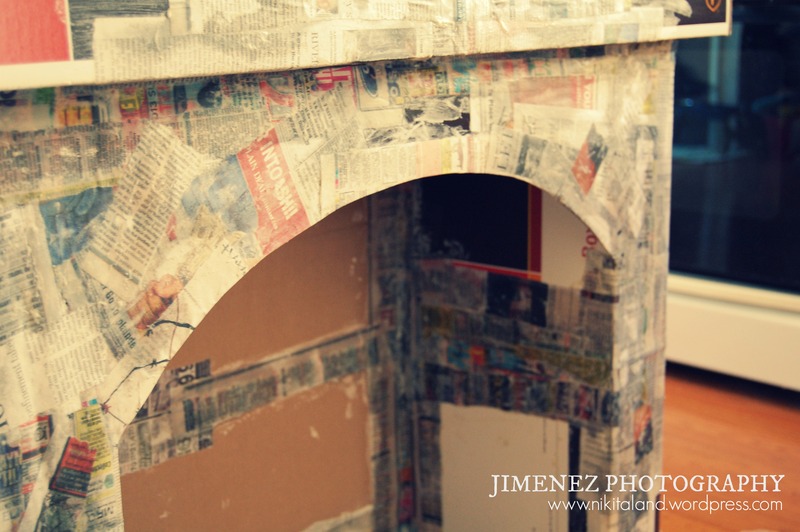 I was nervous on this step, but knew if I messed up I could fix it with more paper mache. The knife actually cut through the paper mache somewhat easily, but you have to make sure not to press too hard on your form to crush it. 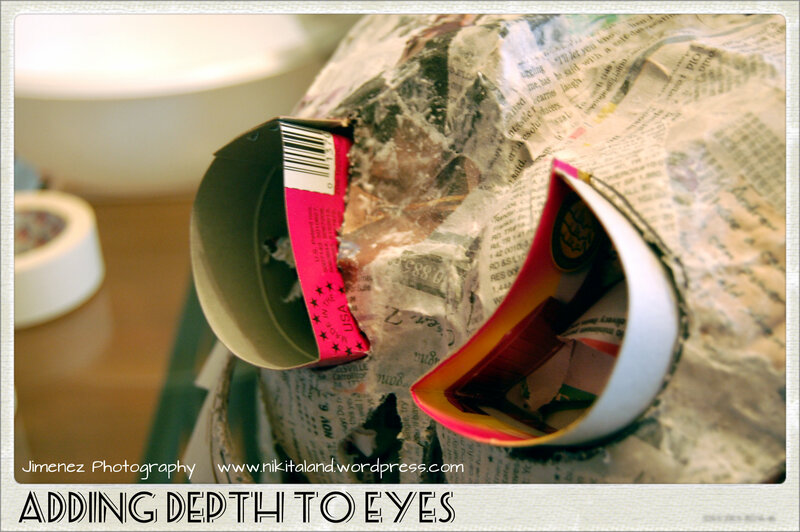 Once I got the eyes and mouth cut out, I started on removing the inside bags and newspaper by slowly and carefully pulling out pieces through the openings. I got everything pulled out somewhat easily, but now the bag that made the form is kinda stuck on the paper mache, so I will have to carefully figure out a way to pull this bag out from the pumpkin. I had to see what it looked like lit up, so I pulled out our battery operated LED tealight and it is now eerily glowing inside the pumpkin. It’s been quite awhile since I did a paper mache project, and I have learned that it does take time to complete, but the whole process is amazing. I still have some work to do on this project, as I want to make the eyes 3-D and give them depth, so back to more paper mache & newspaper strips, then I will paint it and seal it. I hope you have enjoyed what I created, as this pumpkin has truly made my Halloween, and I am still amazed that I made this. I have not taken my eyes off of it all night.